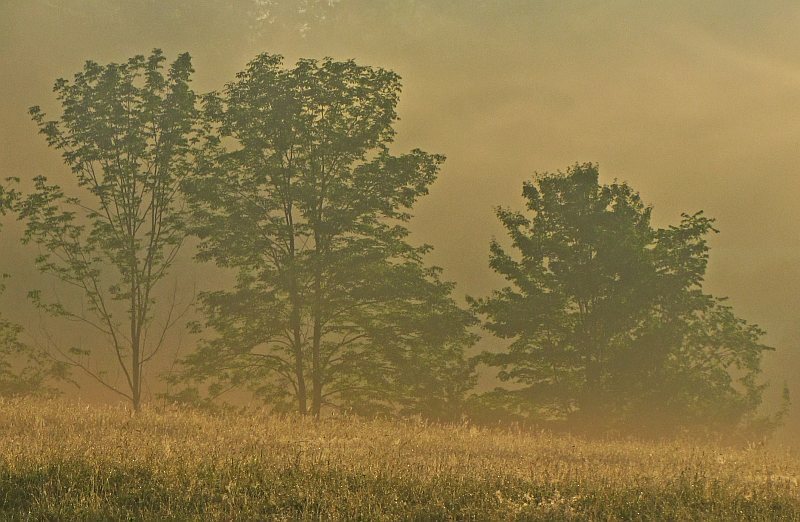 June meadows receive a heavy dew, breath a thick mist, and, in their flowers, display the royal colors of gold and purple. 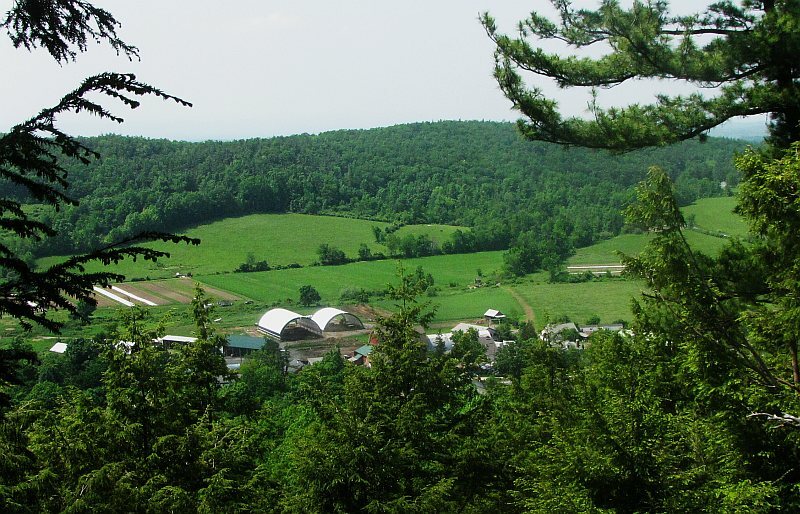 Legumes (that is, members of the pea family) are common in our hayfields and pastures, because their nitrogen-fixing abilities make them good as both soil builders and as animal forage. 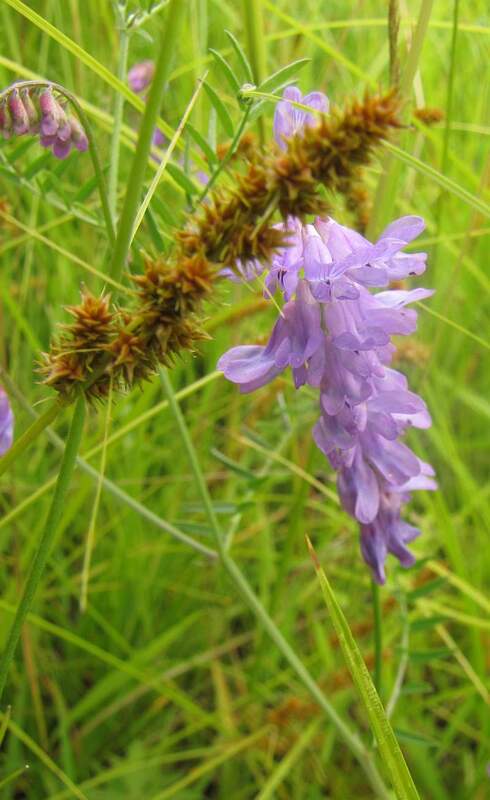 This ornate splay is the European Cow Vetch. 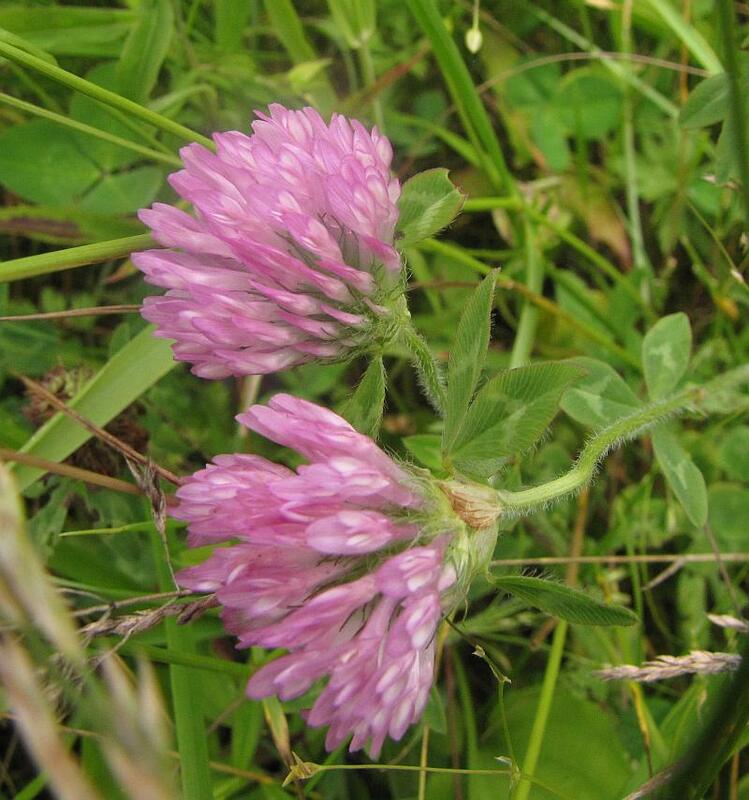 Another popular legume is Red Clover. It is probably our most common field legume. In many cases, the fields are 'frost-seeded' with legumes. That is, the clover seeds are spread over unploughed ground late in the winter, and the seeds work their way down during the usual heaves and drops that accompany soil freezing and thawing. Deptford Pink. Another European species, oft described as a weed.... an elegant weed. 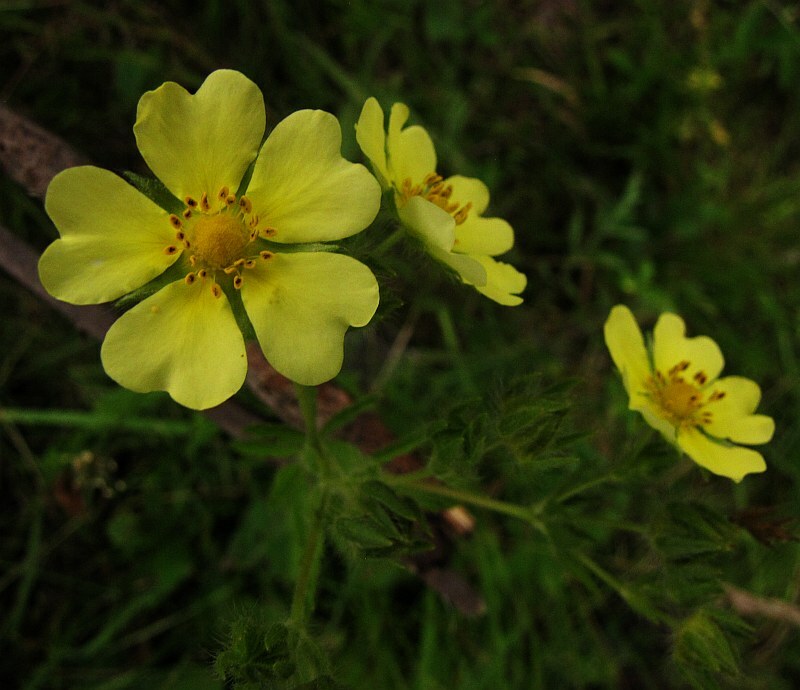 Sulfur Cinquefoil. Unlike the legumes first shown, species like this and the Deptford Pink were probably not intentionally introduced into the fields. In some cases, they just came along for the ride in manure, ballast dirt, plant pots etc that were brought over from Europe. In other cases, they were planted in flower gardens and then struck out on their own. 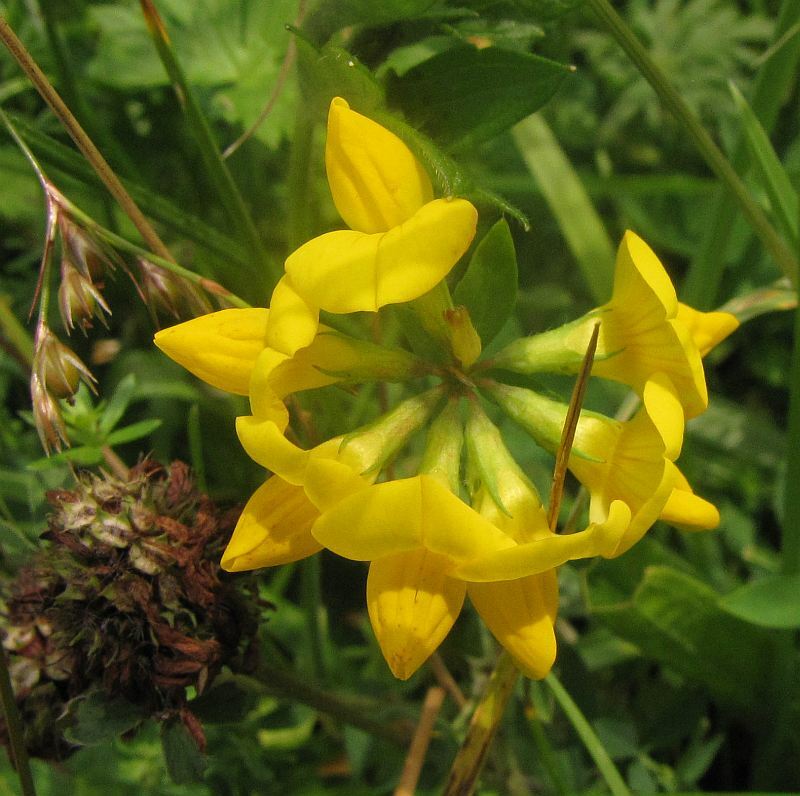 This is a European Buttercup, a frequent resident of our fields and lawns. 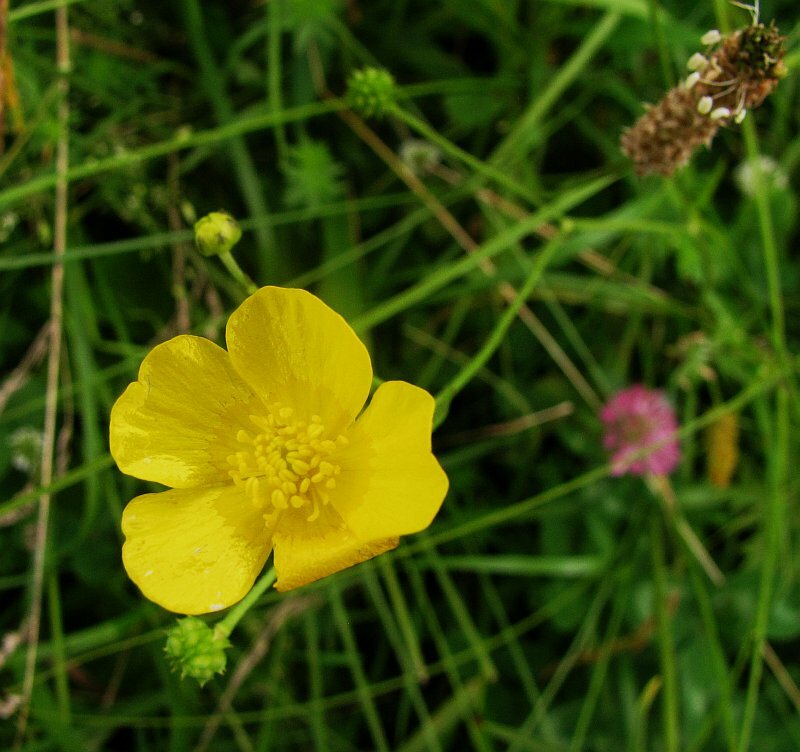 There are native Buttercup species, but this isn't one of them. 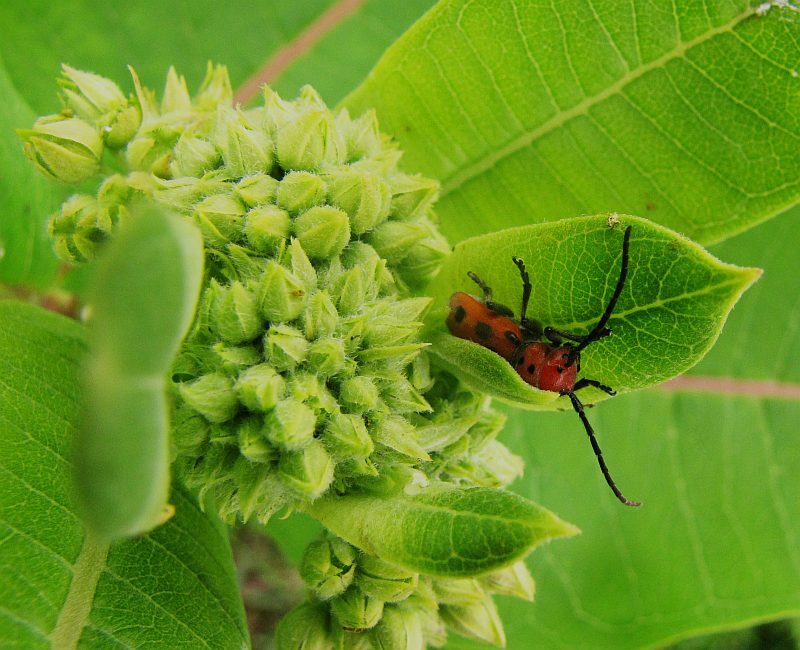 As a transition of plant to bug, here's a Milkweed Beetle hanging out on Milkweed buds. Note the similar coloration between this and the Monarch. Bright red may alert potential predators that such insects are packed with a bad mouthful of chemicals and are best left alone. Milkweed in bloom. 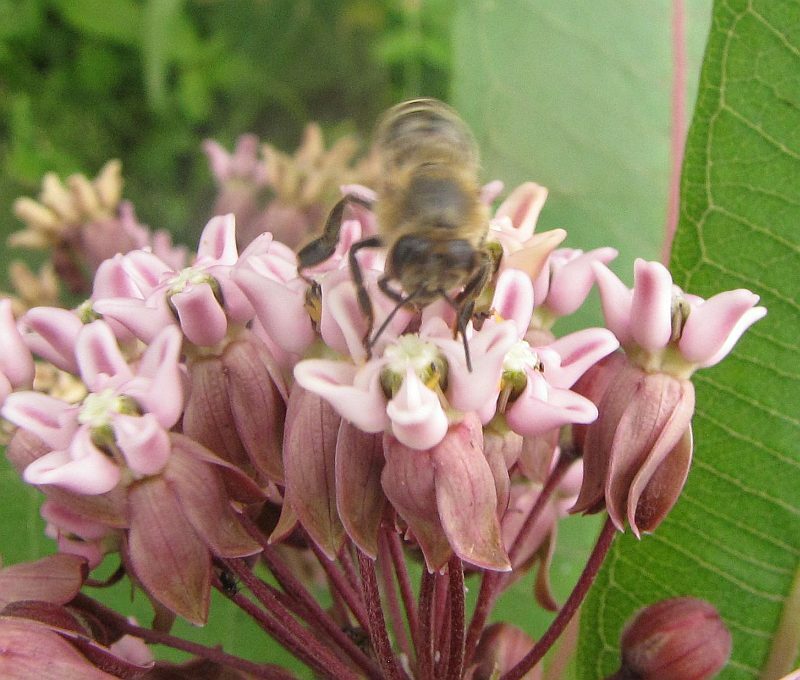 The Honey Bee (also from the Old World... but the Milkweed is not) is out of focus because it was quite agitated. With good reason... its foot is caught in the milkweed flower and so begins our tale. 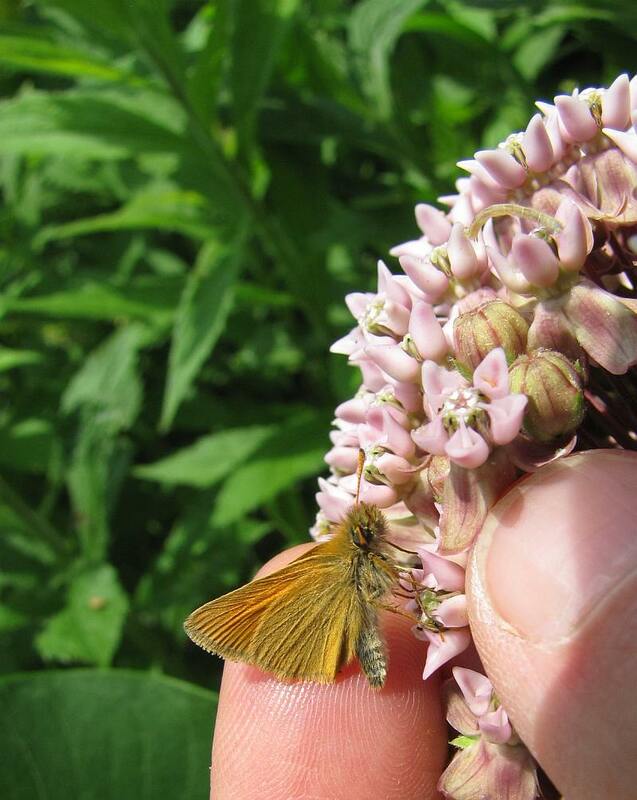 The previous week, at a site in Dutchess County, I had noticed these small European Skippers dangling from a Milkweed flower. Often such flower-trapped insects turn out to be the work of crab spiders which hide out in the blossoms and ambush unsuspecting visitors. 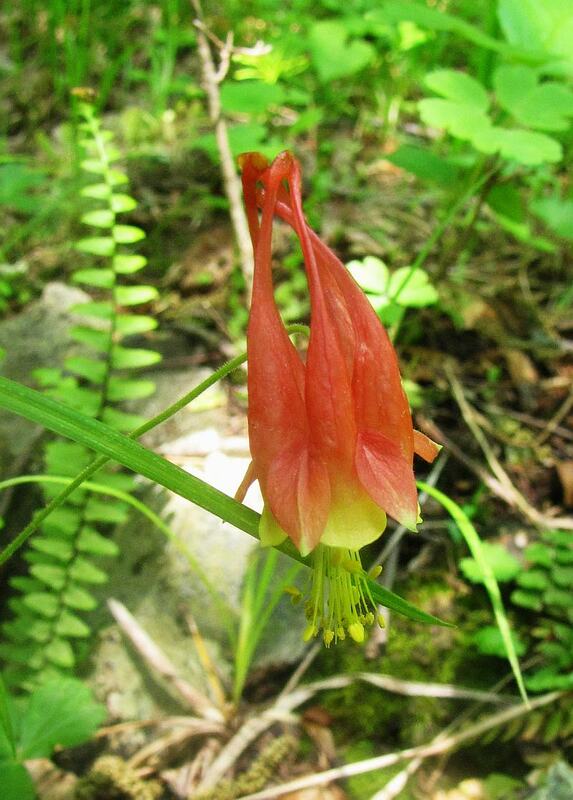 But in this case, it was the flower itself who was trapping the prospective pollinator. This picture leads us a bit closer to an explanation. 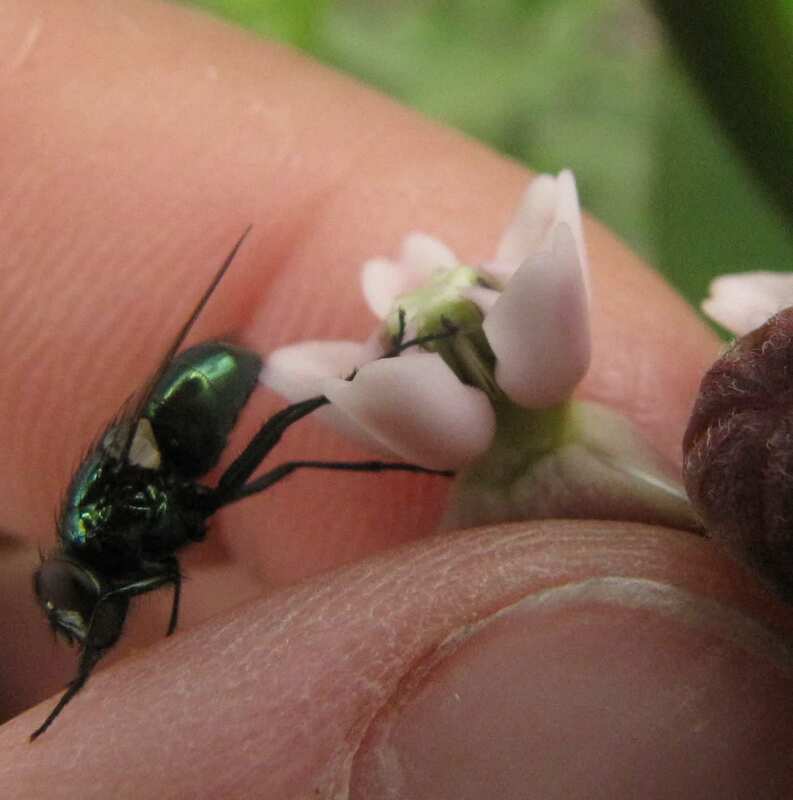 The leg of this fly can (more or less) be seen inserted into a slit located between the two petals. 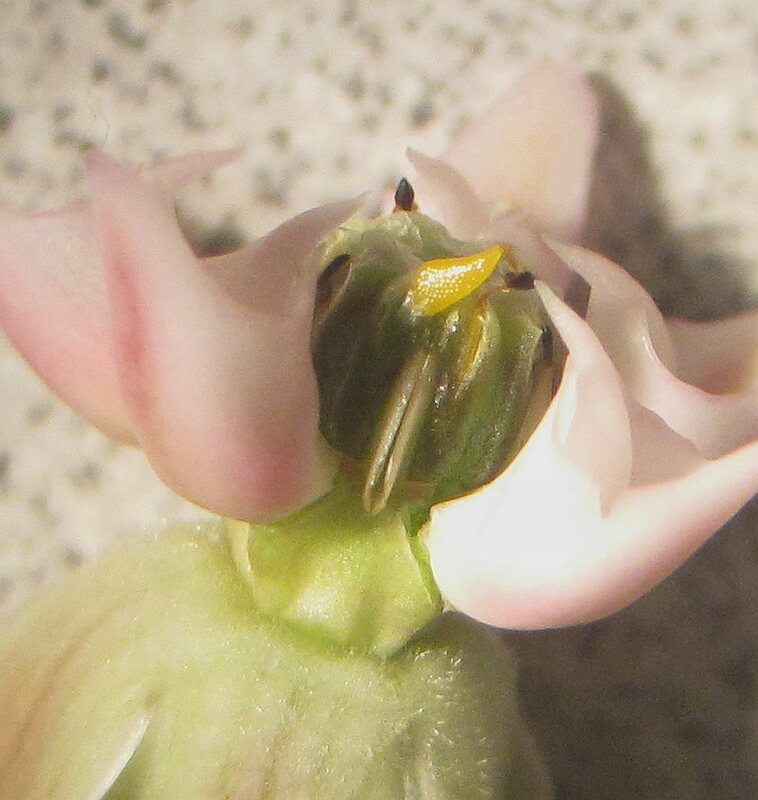 Here's a close-up of the Milkweed flower, with the petals parted slightly to show the slit between them. At the top of that slit, the black speck is the structure that holds two pollen sacks together. Picture an insect that has poked its leg into the slit while trying to get a grasp on the nectar-rich flower. As the insect pulls its leg out of the slit, it catches on the notch in the black structure. Its struggling begins to pull the pollen sacks (the yellow structures in the picture) out of the slips where they have been resting. 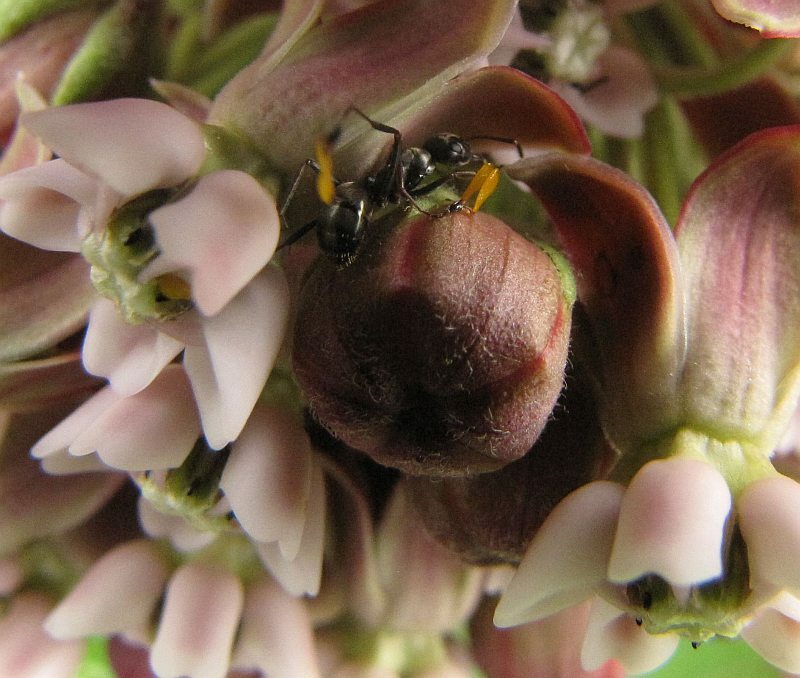 If the be-decked flower-visitor continues to visit Milkweed flowers then, sooner or later, one of its dangling pollen sacks (called pollinia, singular=pollinium) will slip into another flower's slit and get caught, as has happened here. 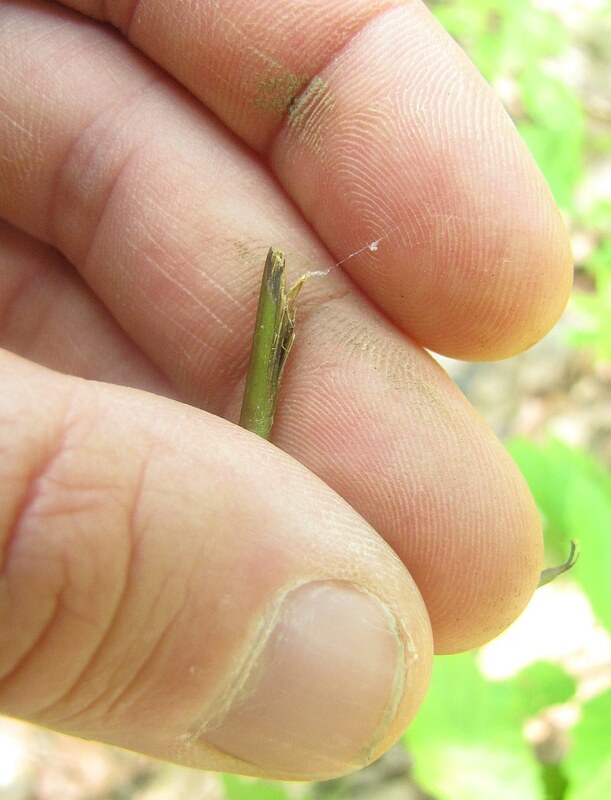 I did not pluck this leg from an insect. Often, unable to remove their leg or break-off the pollinium, the insect jettisons its leg, leaving it behind to adorn the flower. Here, I have moved the un-fettered pollinium to one side, so that one can better see the trapped one. 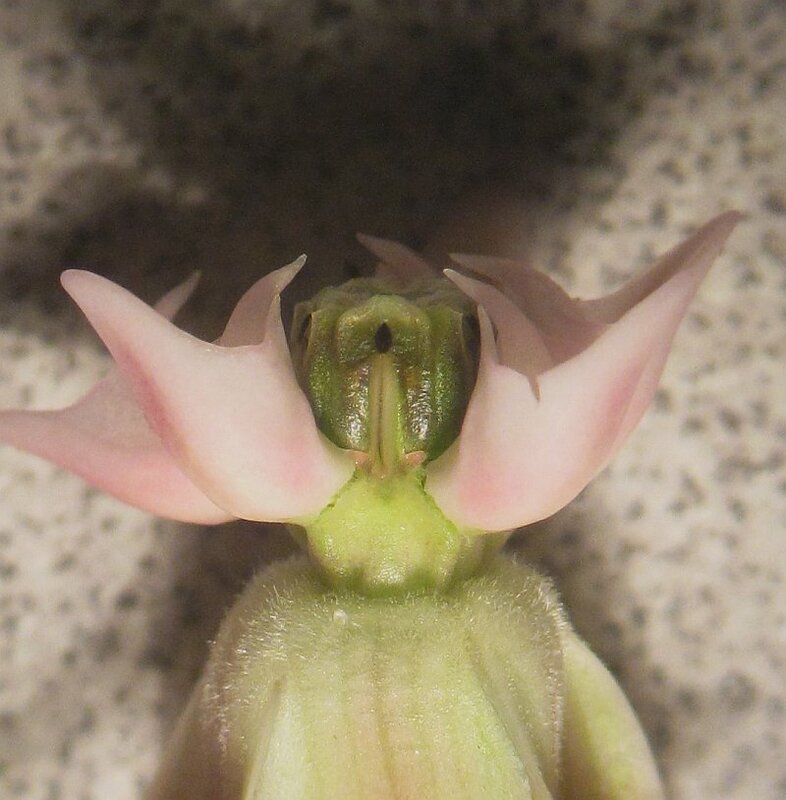 This last picture comes from the partial dissection of a Milkweed flower that had no obvious insect parts attached to it. 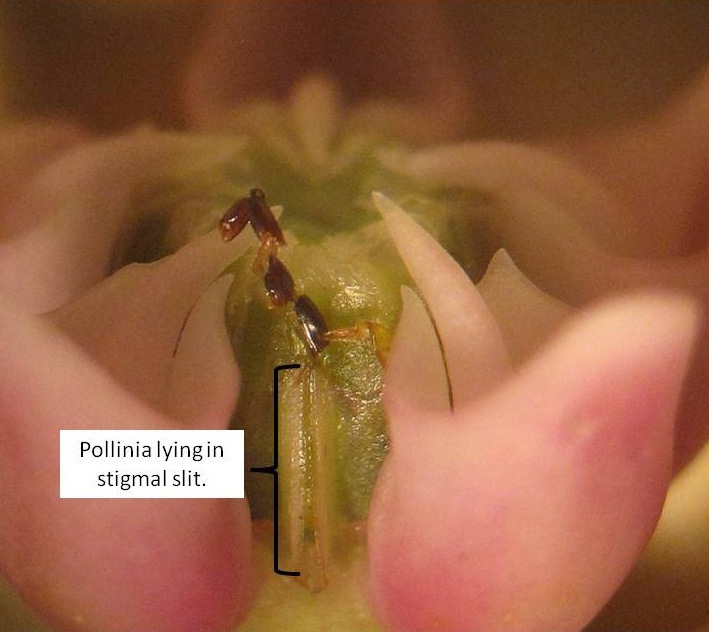 Lying inside of almost every slit was a detached pollinium as shown here. 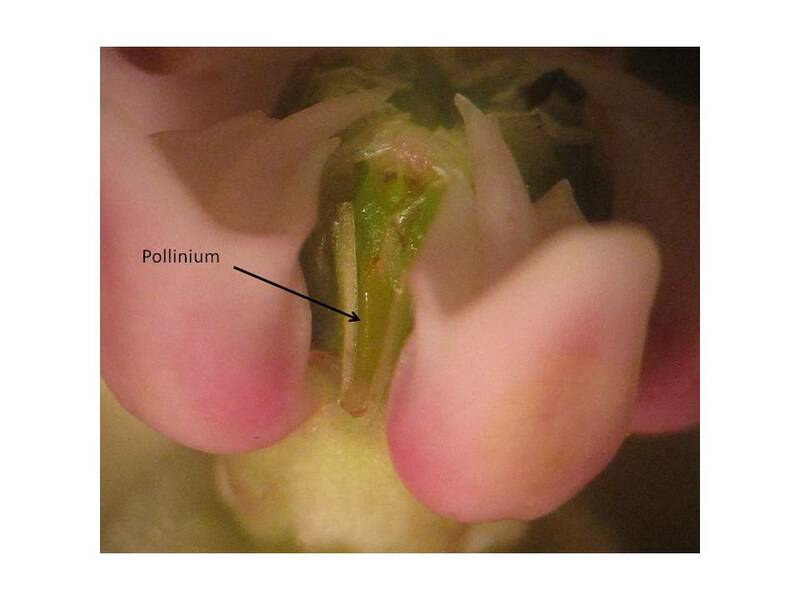 Importantly, also inside of each slit are the flower's stigma - the female receptacle for the pollen. 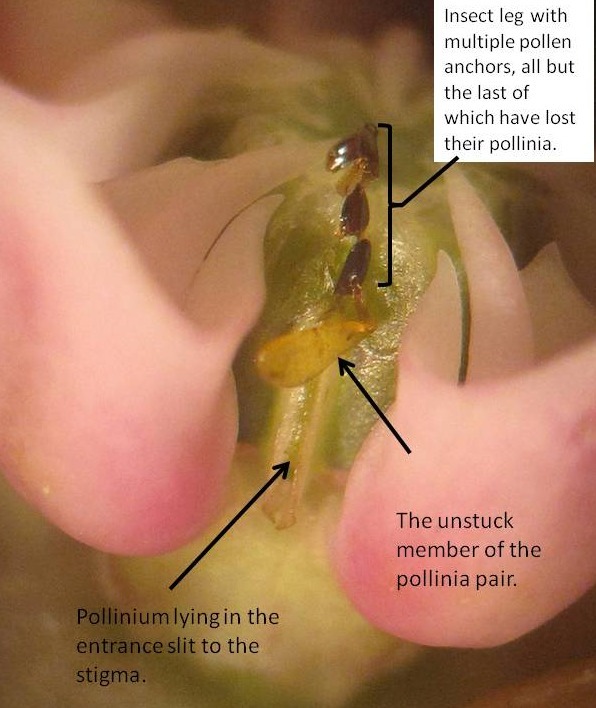 Once a pollinium as become trapped in a stigmal slit, it apparently hydrates with nectar and eventually the sack dissolves and the pollen fertilizes the flower. 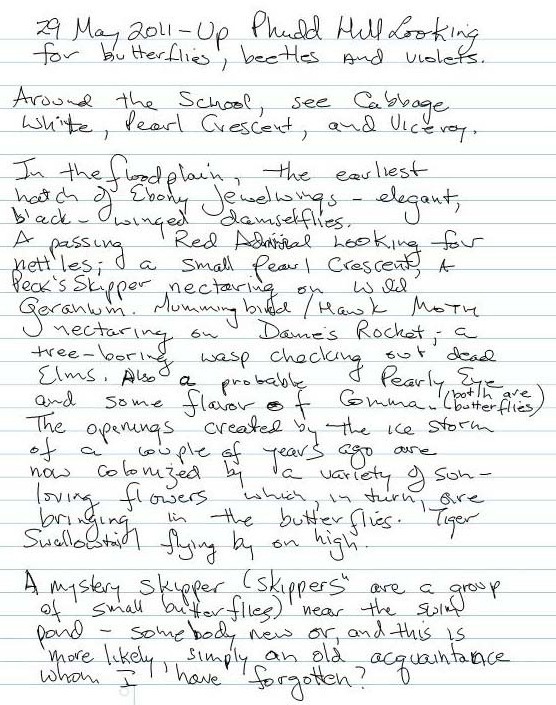 Craig Holdrege of the nearby Nature Institute has written a very nice description of milkweed including a description of the pollinization process. 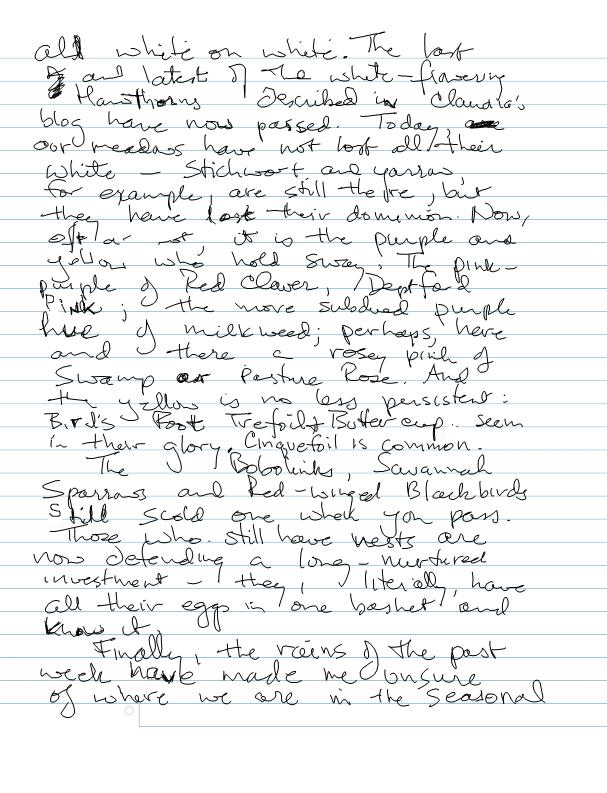 Click here to read his interesting account. 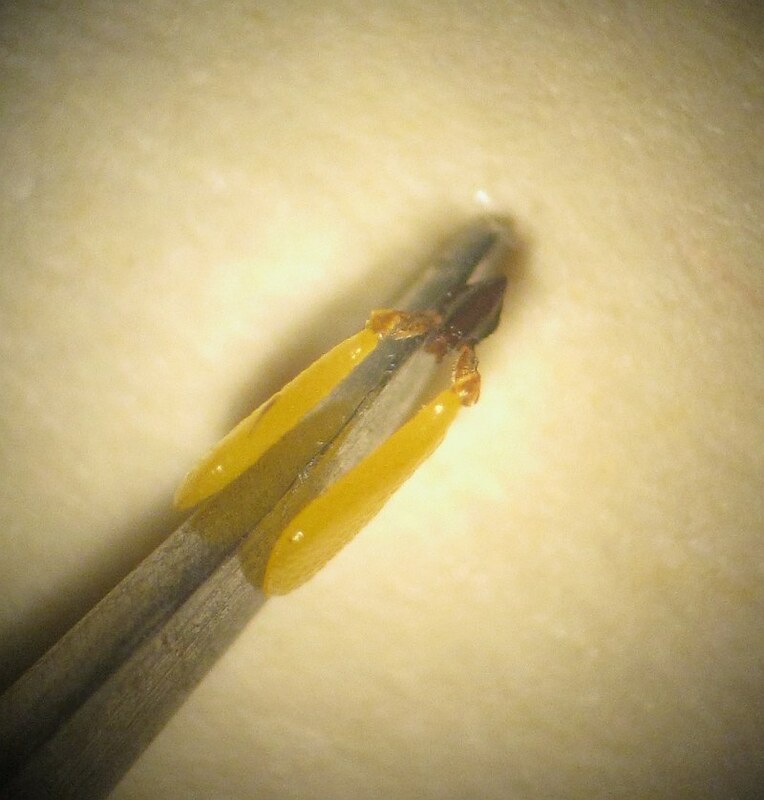 To close, just a few more invertebrate miscellania. 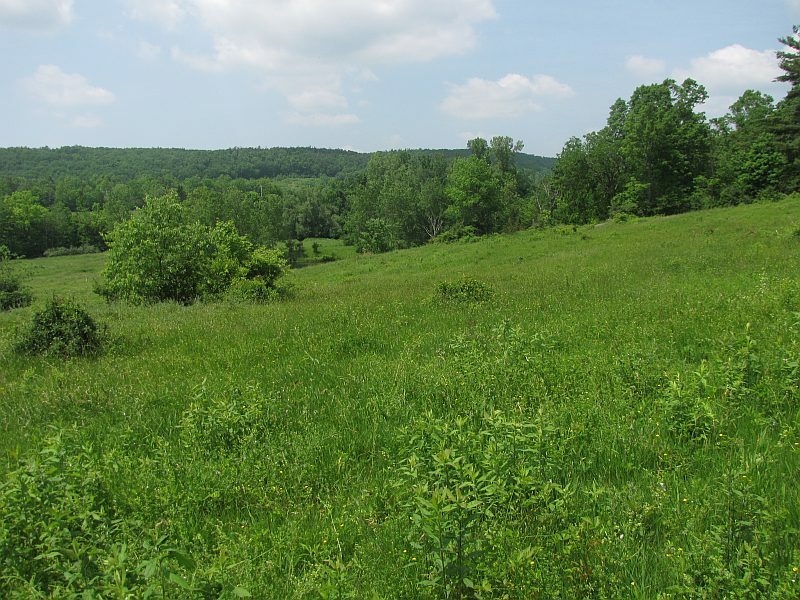 Move the plant stalks aside and get to the ground surface of the meadow, and you'll probably see a spider or two scurrying across the surface. These are Wolf Spiders, a family of spider which hunt their prey not with a web but by the chase. They do, however, make silk. As this mother spider illustrates, they use it to wrap up their egg mass into a handy purse which they carry about underneath them. 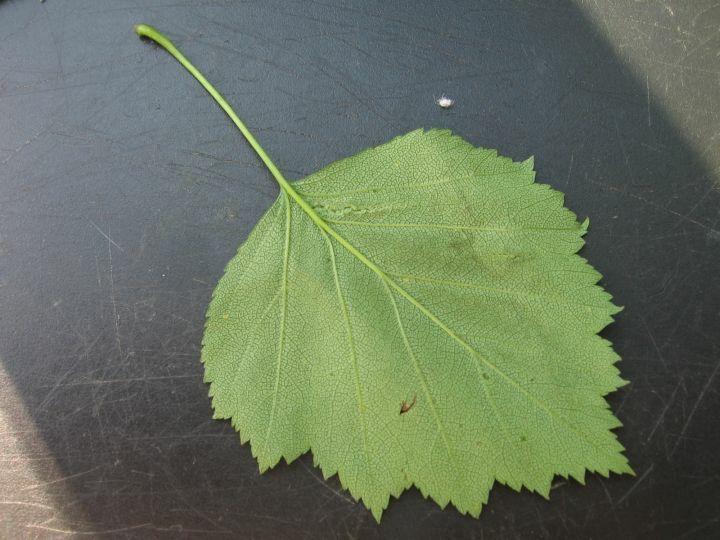 This mass was dangling below an elm leaf that overhung the Farm Creek. What was this furry spot? Looking more closely, it turned out to be a swarm of little heads looking up at me. 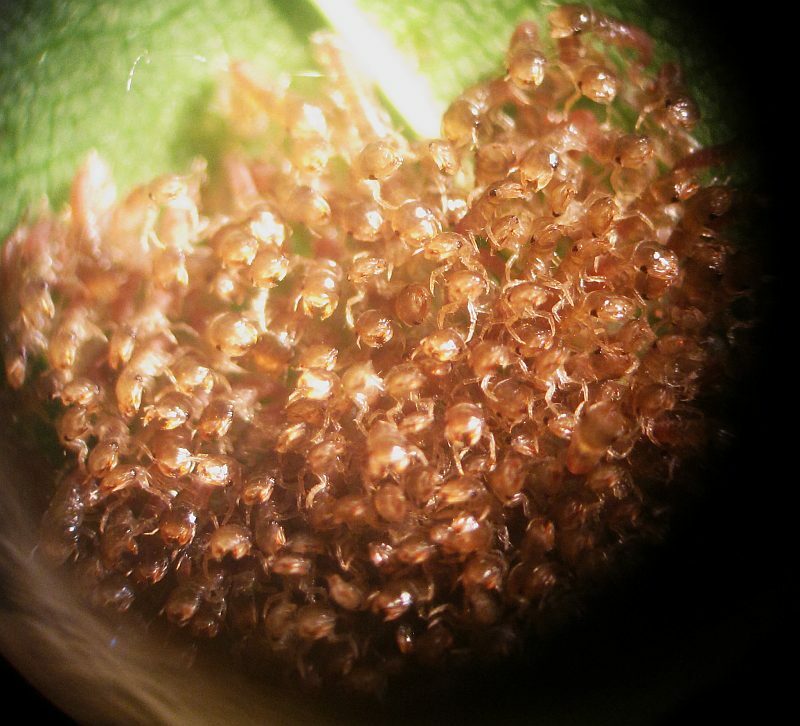 These are probably alderfly larvae which have just hatched from an egg cluster that had been stuck to the leaf and which was barely visible beneath their feet. 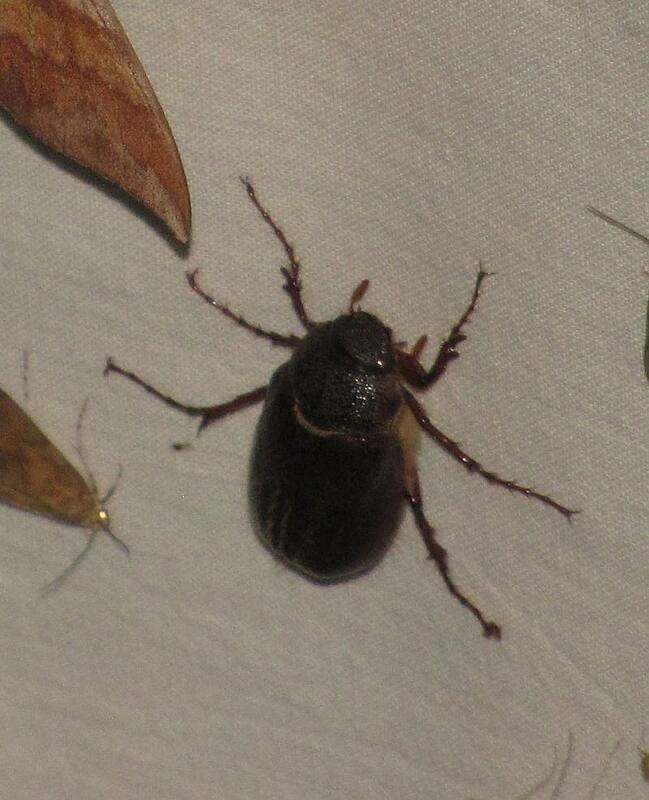 May (or June) Beetles (or Bugs) are fairly large beetles that often come to lights during this time of year. For a while, a few weeks ago, they seemed particularly abundant. Such abundance doesn't often go unnoticed in the biological world. Gisela and Michael-James showed me this "light fly" that they had caught . Apparently, this fly parasitizes adult June beetles, ovipositing on the beetle as it flies (when the soft parts are exposed). 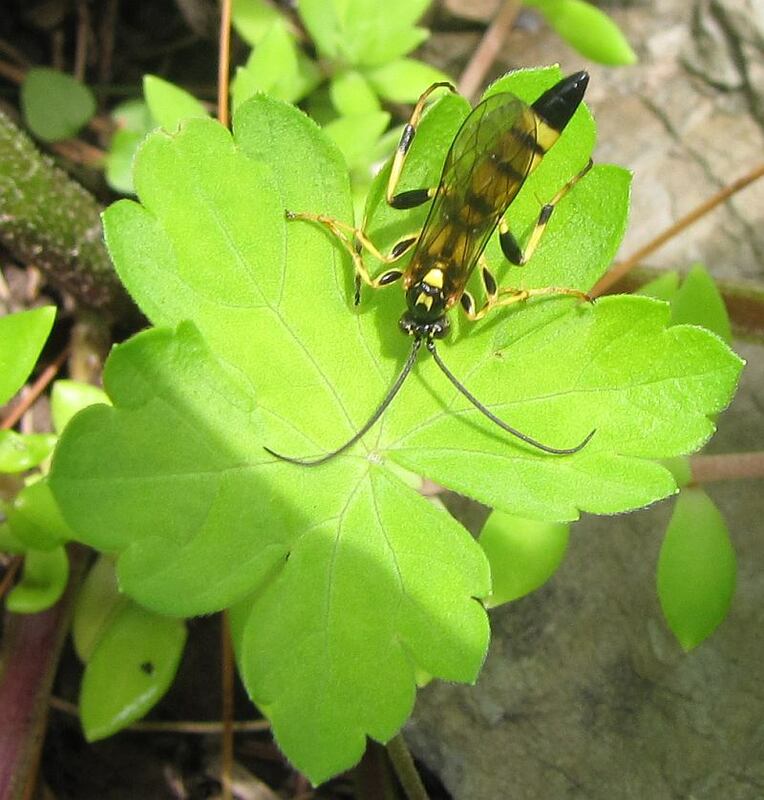 Finally, this is a "Ichneumon annulatorius" wasp, not that that tells us much. Apparently, it is known to parasitize Army Worms. 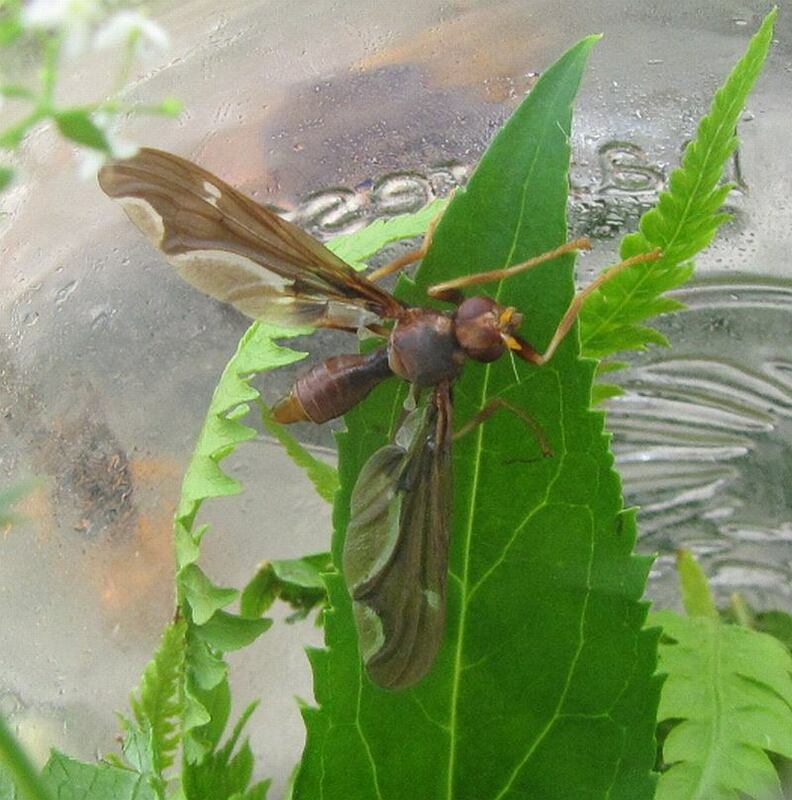 Some wasps, if not this particular one, are parasites on the larvae of insects such as June Beetles. Of course, the “e” at the end of Hawthorn indicates that the founders of Hawthorne Valley were paying homage at least in part to Nathaniel Hawthorne. 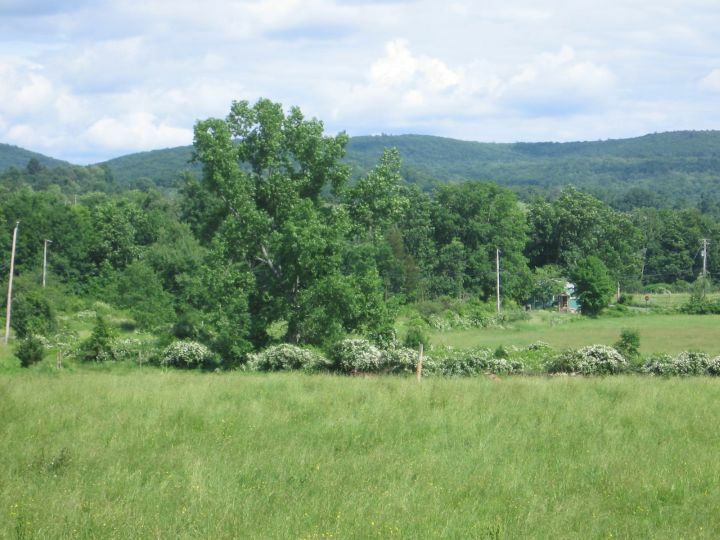 However, a double-meaning was intended from the beginning, honoring at the same time a plant that is common in the hedgerows and lightly grazed pastures of our valley. 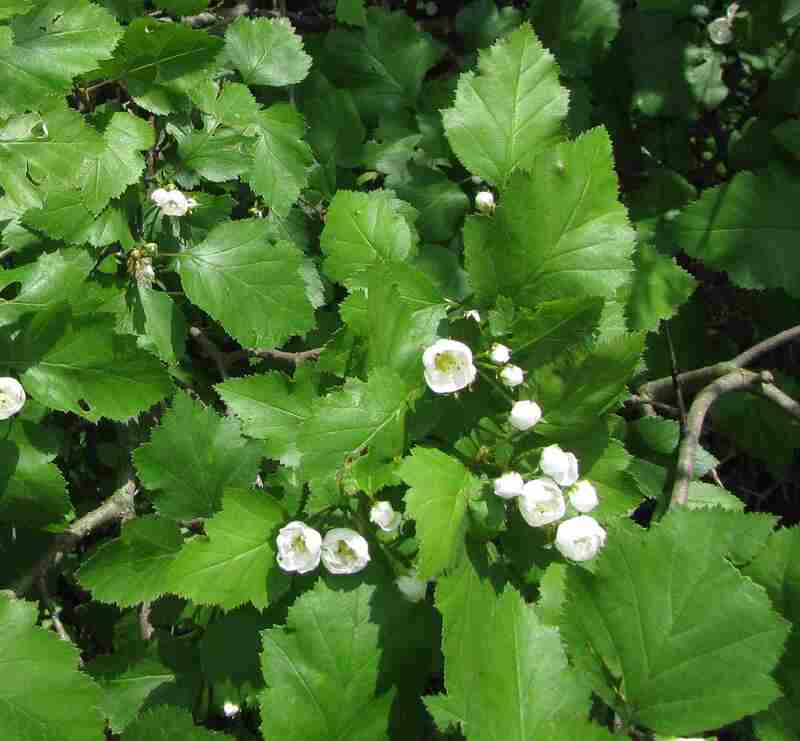 Hawthorns are shrubs or small trees with long thorns on their branches and sometimes even emerging from their trunks. 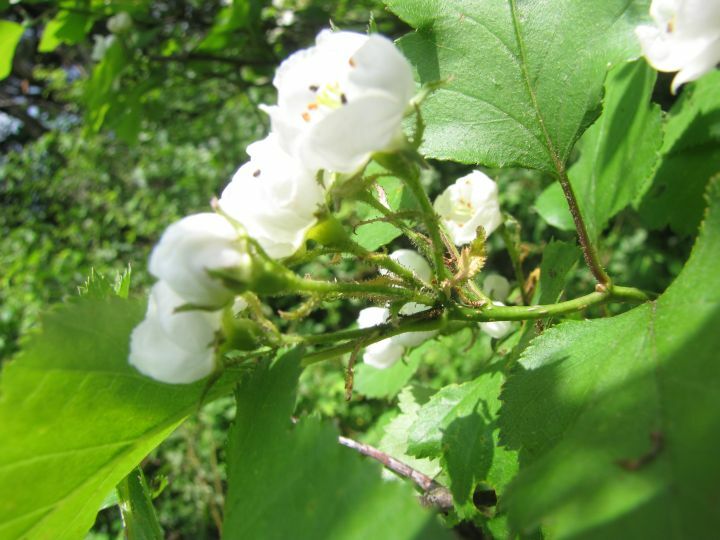 Their thorns are much longer (often several inches long) and sturdier than those of other “prickers”, such as the rose bushes, raspberries and blackberries (often collectively referred to as “brambles”), which also abound in the Valley. 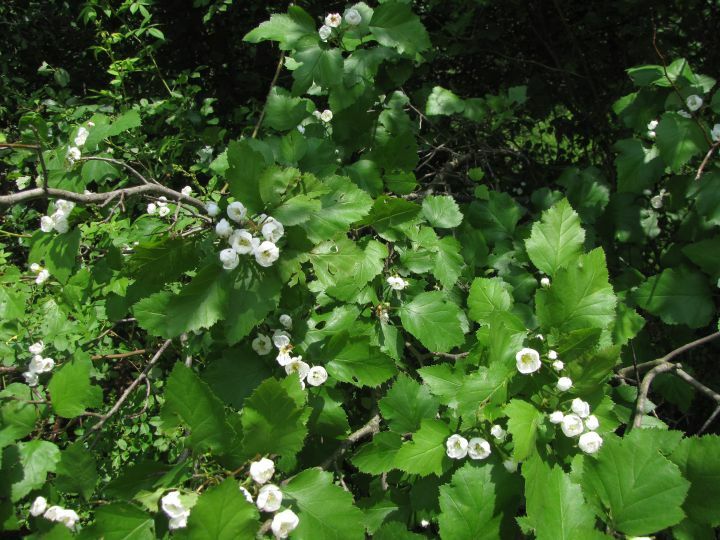 Hawthorns all have white flowers and bloom mid May through mid June, some early-flowering species present their flowers at the same time as their leaves are emerging, the later-flowering species bloom in full foliage. This year, we made an effort to observe the Hawthorns in our Valley, as one by one the bushes came into bloom, and tried to train our eyes to see the sometimes subtle differences in leaf shape, pubescence (how many little hairs there are), and flower morphology between the different species within that group. 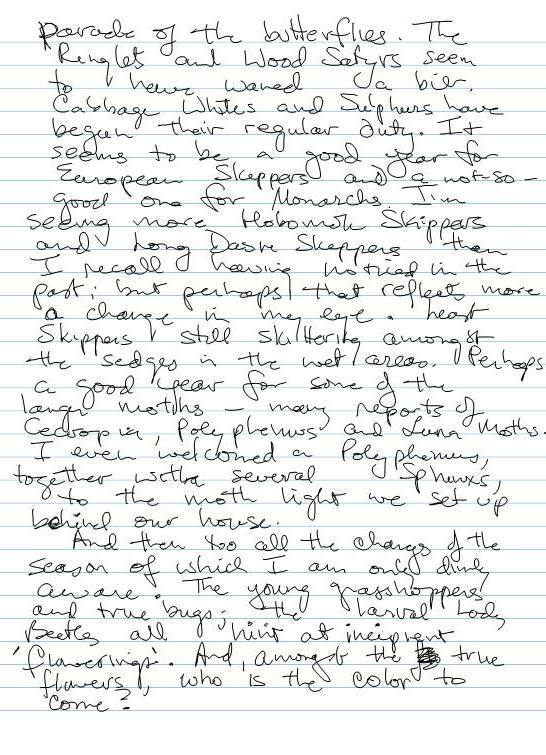 We were motivated by David Werier, an excellent botanist from Ithaca and one of the authors of the New York Flora Atlas (http://newyork.plantatlas.usf.edu/), who had alerted us to the fact that the distribution of the different Hawthorn species is really not yet well documented throughout the entire state of New York. 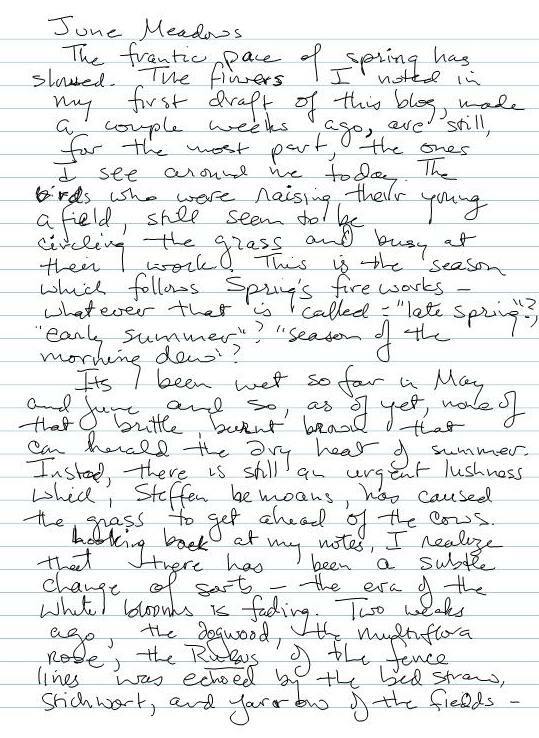 David joined us for a day in late May to see how many different Hawthorn species we could find right here in Hawthorne Valley. 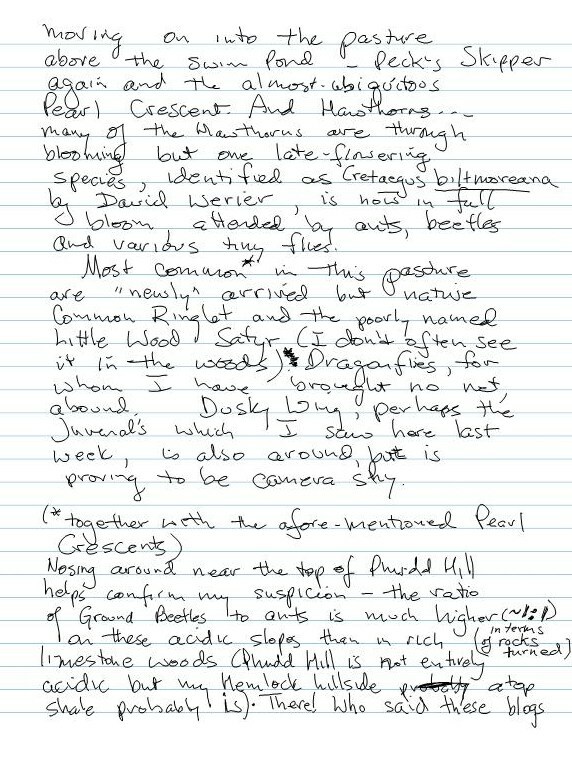 With the help of David’s trained eye and the most recent botanical key for the Hawthorn group in New England on his i-pad, we found ten different Hawthorn species in the Valley that day. Some of them are quite distinct, as soon as one cares to pay attention. Others are differentiated by more subtle characteristics, which I yet need to train myself to see. 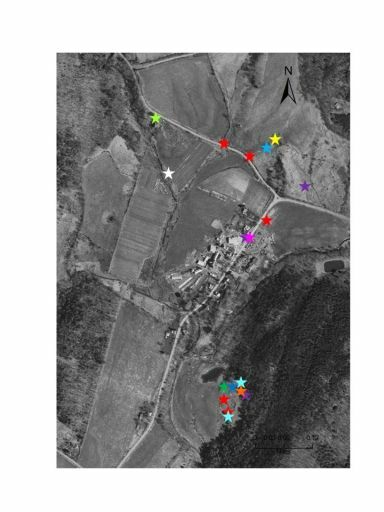 On this birds-eye view of Hawthorne Valley, the different colored stars indicate plants of different Hawthorn species. 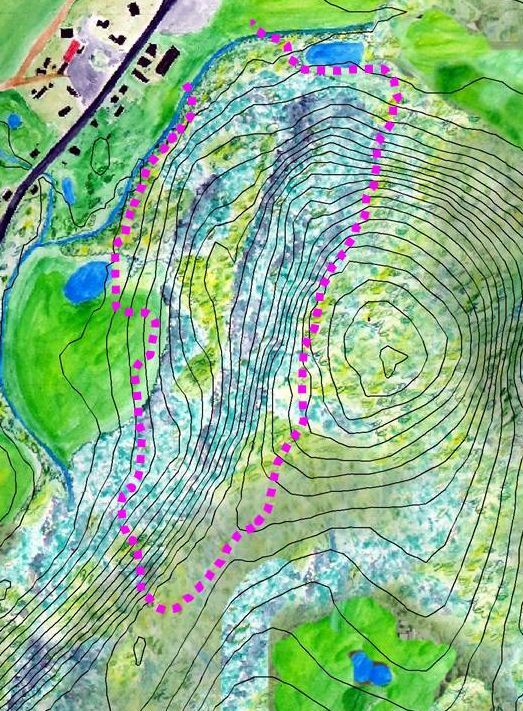 This is by no means a complete map of all Hawthorns in the Valley, but it gives an idea of their spatial distribution and where one could go to observe the variation between species: Crataegus coccinea (red stars), Crataegus pruinosa (blue stars), Crataegus crus-galli (yellow star), Crataegus dodgei (purple stars), Crataegus dissona (pink stars), Crataegus populnea (dark green stars), Crataegus biltmoreana (teal stars), Crataegus macrosperma (white star), Crataegus phaenopyrum (light green star), and Crataegus sp., yet unidentified but clearly different from any aforementioned (orange star). 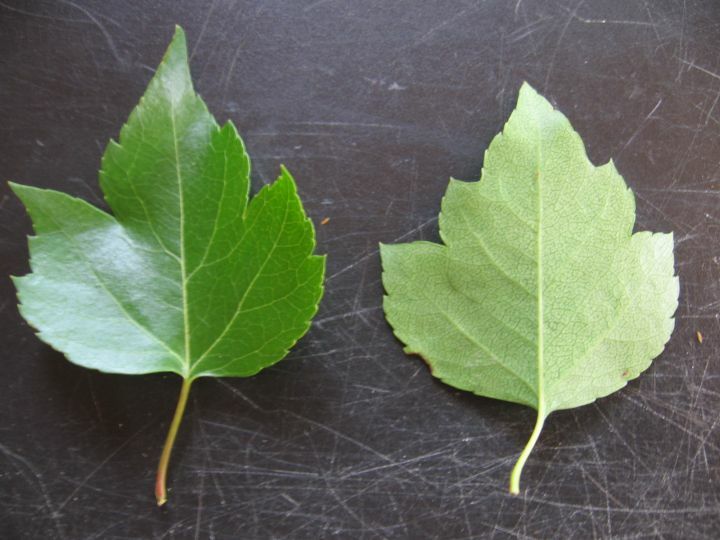 The taxonomic terminology follows Arthur Haine’s soon to be published “Flora of New England”. 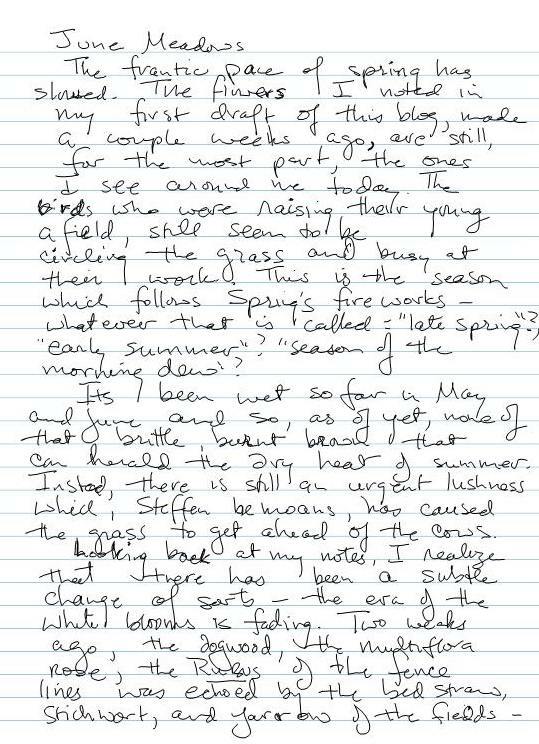 A late-flowering Hawthorn grows in the parking lot of the Creekhouse and is in full bloom as I write this. 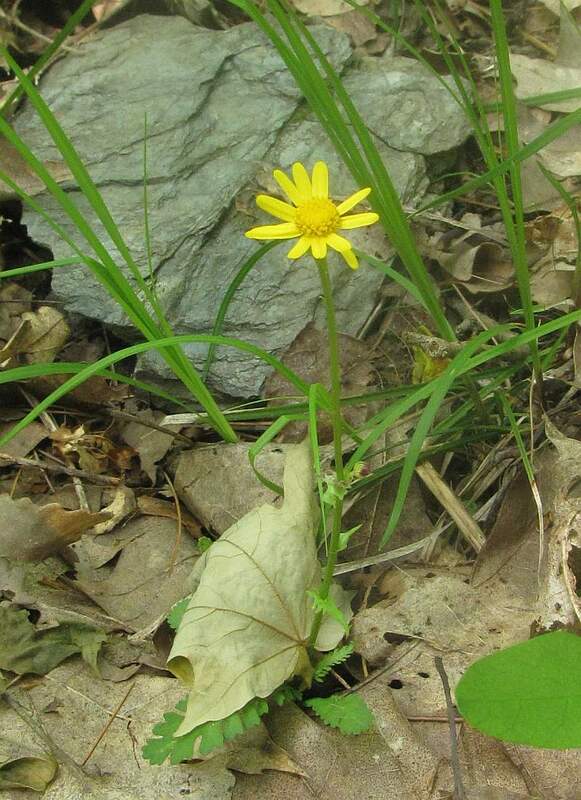 It is a species native to North America, but not to New York State and is often used as an ornamental. 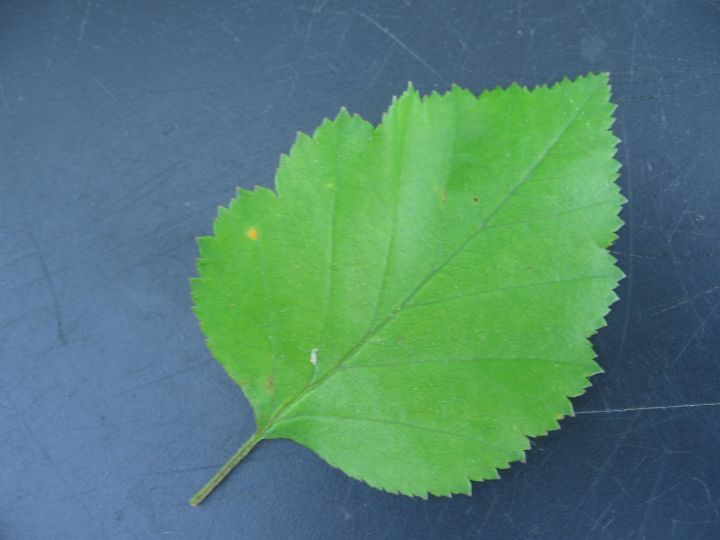 Crataegus phaenopyrum (Washington Hawthorn). Flower cluster of Washington Hawthorn. This is our latest-flowering Hawthorn. 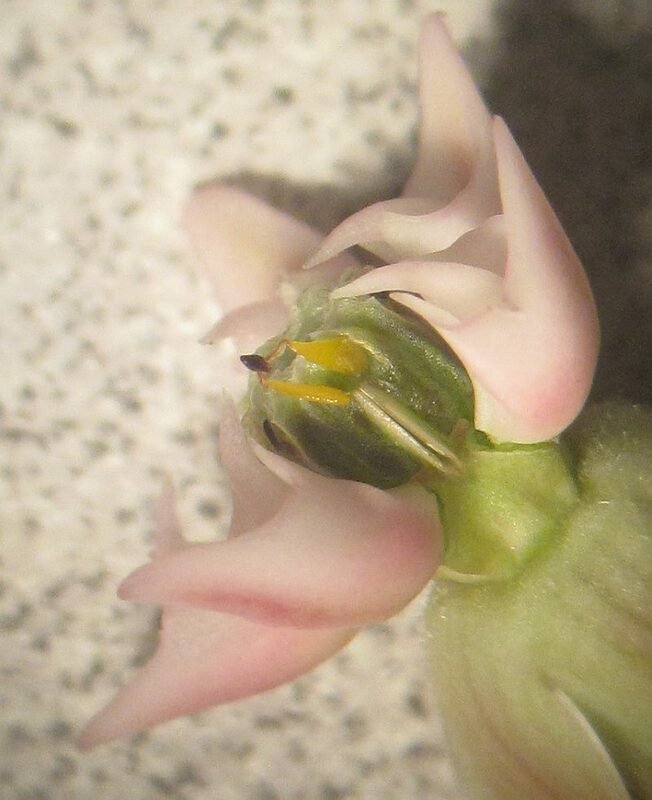 The inflorescence is glabrous (no hairs), each flower has two rows of stamens and 3-5 styles. 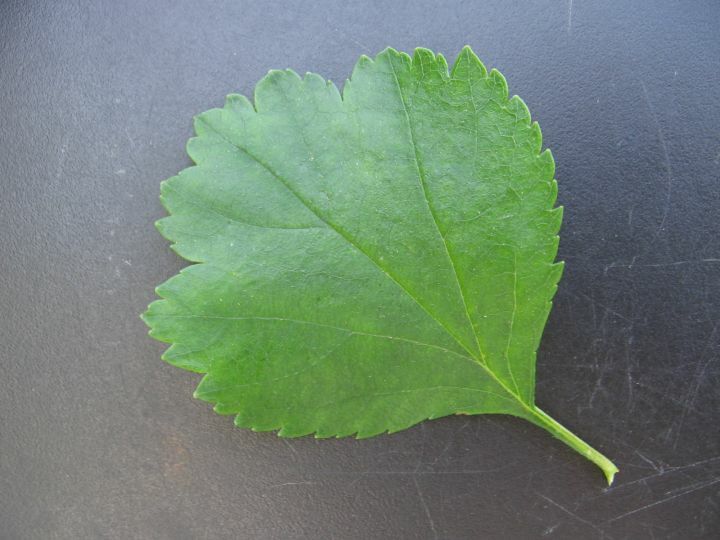 Leaves of Washington Hawthorn are very smooth and shiny, no hairs whatsoever. 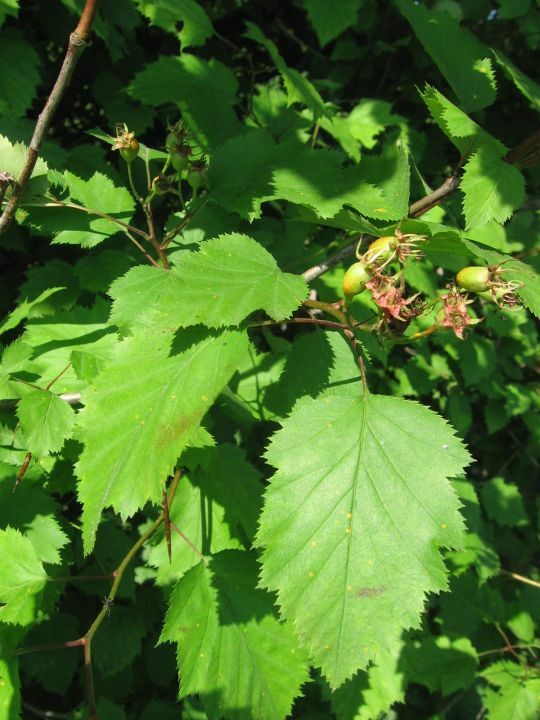 Their lobed shape is similar to that of many other Hawthorn species. In contrast, this was the earliest-flowering Hawthorn. We observed it (but did not photograph it) in full bloom a month ago. 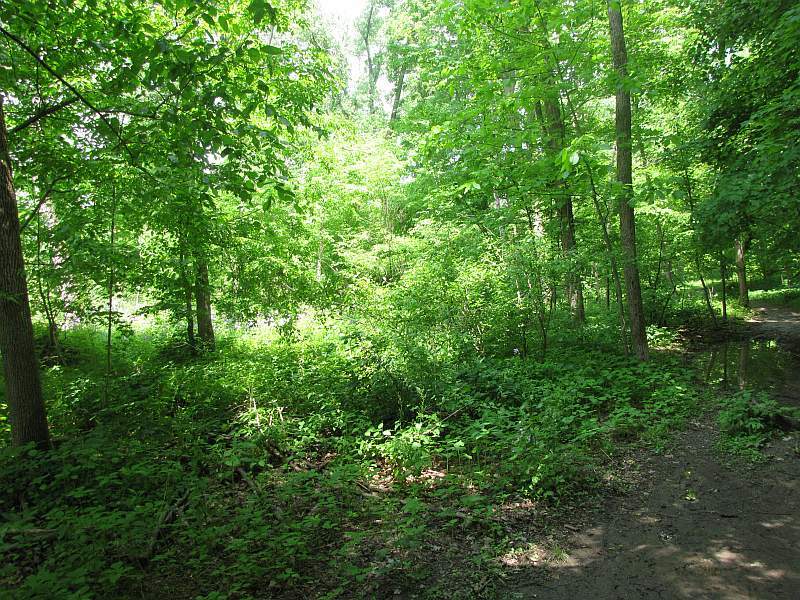 It grows on the north side of Harlemville Road between the Creekhouse and Banjo Mountain Cafe. 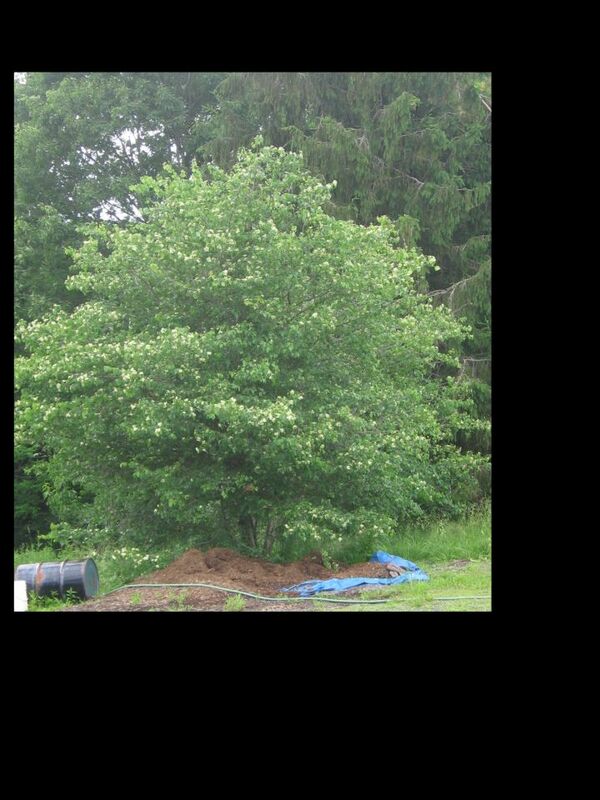 It is an example of Crataegus coccinea (Scarlet Hawthorn). Young fruit of Scarlet Hawthorn. They are clearly nothing else than "miniature apples". 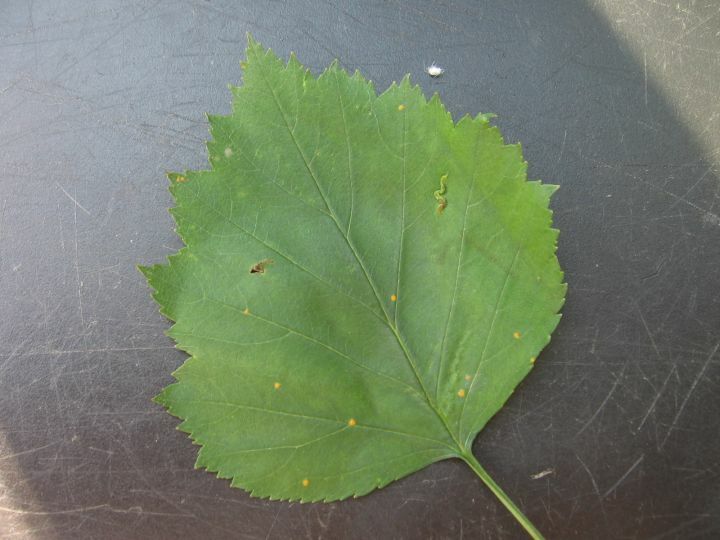 Leaf of Scarlet Hawthorn with a dull green upper side that is slightly velvety to the touch due to a sparse covering with short hairs. 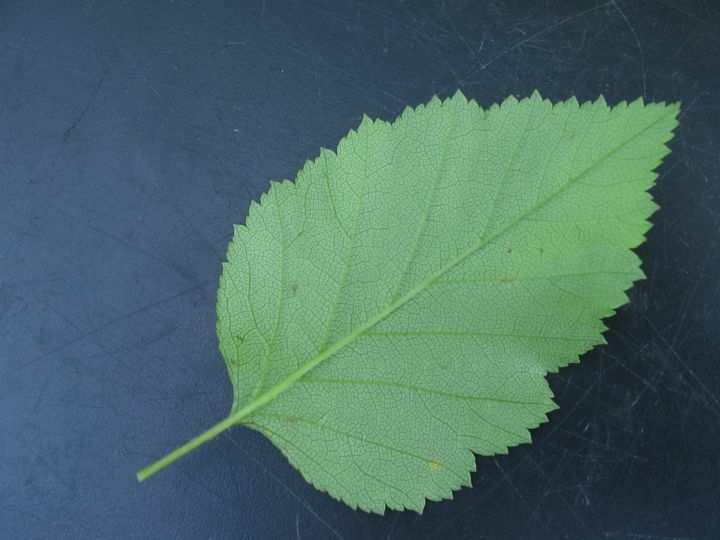 Under side of leaf of Scarlet Hawthorn, which is less hairy than the upper surface. Crataegus pruinosa (Waxyfruit Hawthorn) in the shrubby pasture above the Swimming Pond. Waxyfruit Hawthorn flowered just after Scarlet Hawthorn and is now developing its fruit. 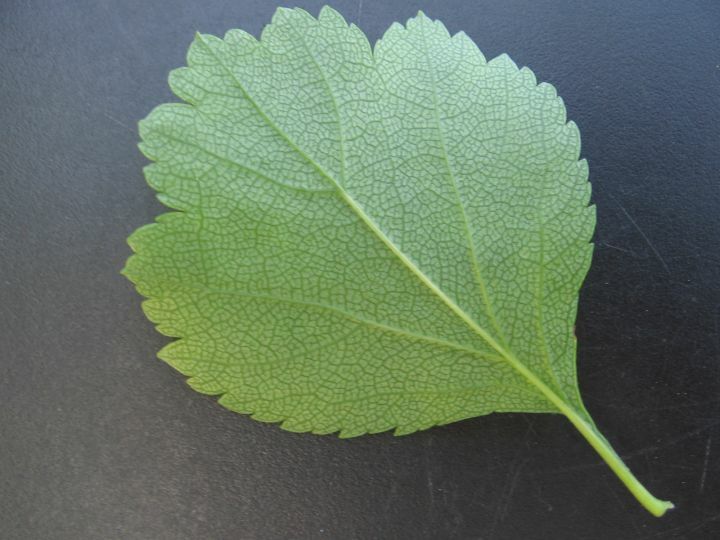 The smooth upper surface of the leaf of Waxyfruit Hawthorn. It is totally devoid of any hairs. 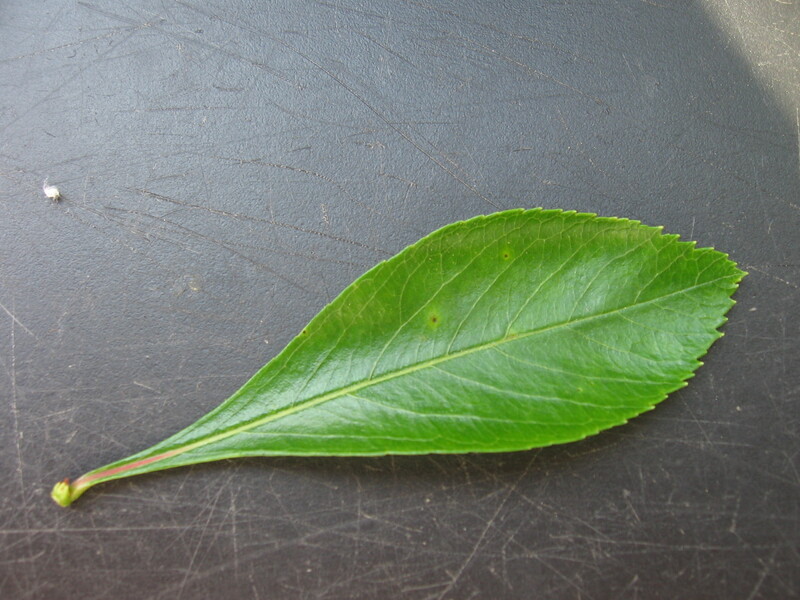 No hairs grow on the under side of the leaf of Waxyfruit Hawthorne either. 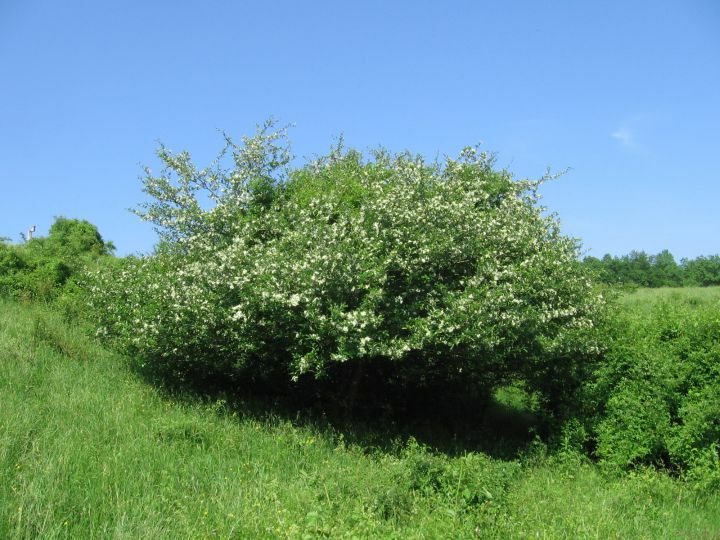 One of my favourite specimens, a Crataegus crus-galli (Cockspur Hawthorn) in the field north-west of Banjo Mountain Cafe (just west of the little pond)... This species is one of the latest-flowering in our fields. If it were not for the unmistakeable thorns, the Cockspur Hawthorn almost does not look like a typical Hawthorn. 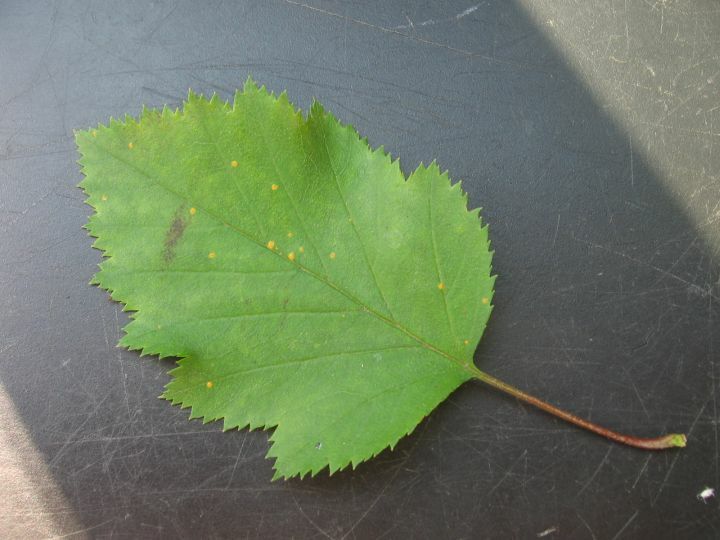 The leaves of Cockspur Hawthorn are super-shiny and not lobed at all! 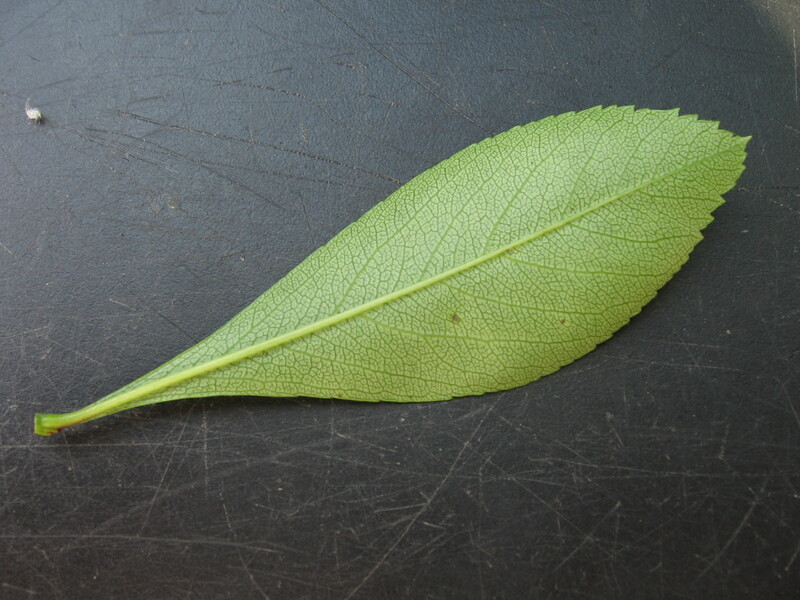 Leaf under side of Cockspur Hawthorn. 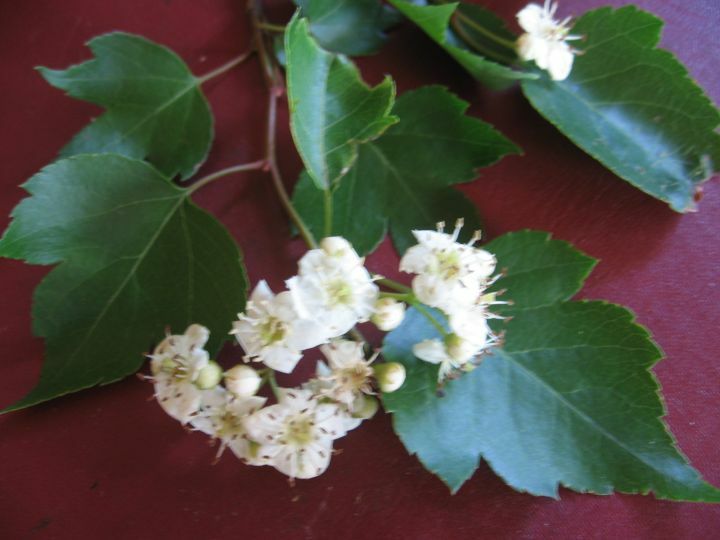 Another very distinctive, late-flowering species is Crataegus biltmoreana (Biltmore Hawthorn). 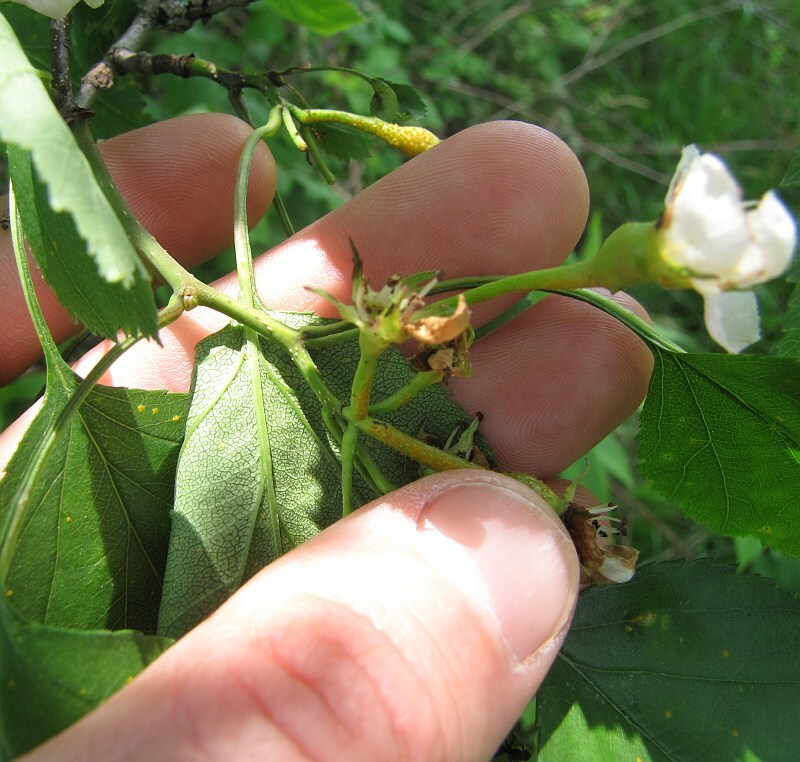 While the leaves of Biltmore Hawthorn are similar to those of several other species, the glandular hairs on the flower stalks and sepals make it easy to recognize. ... as well as below. 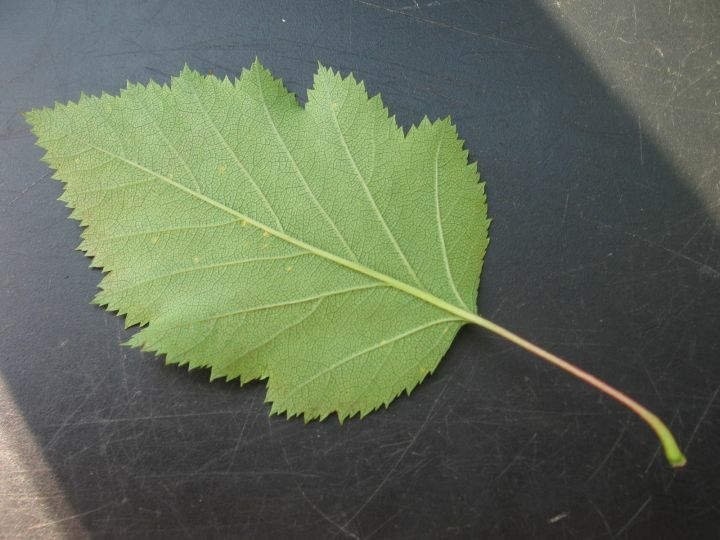 This round-topped leaf belongs to yet another species, Crataegus dodgei (Dodge's Hawthorn). 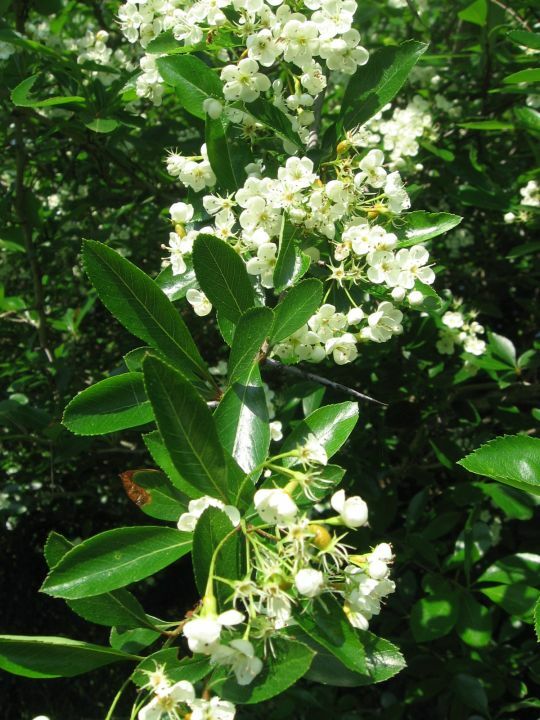 A word of caution at the end: we have several other white-flowering shrubby plants that tend to be more common than Hawthorns in the pastures and hedgerows here in the Valley. 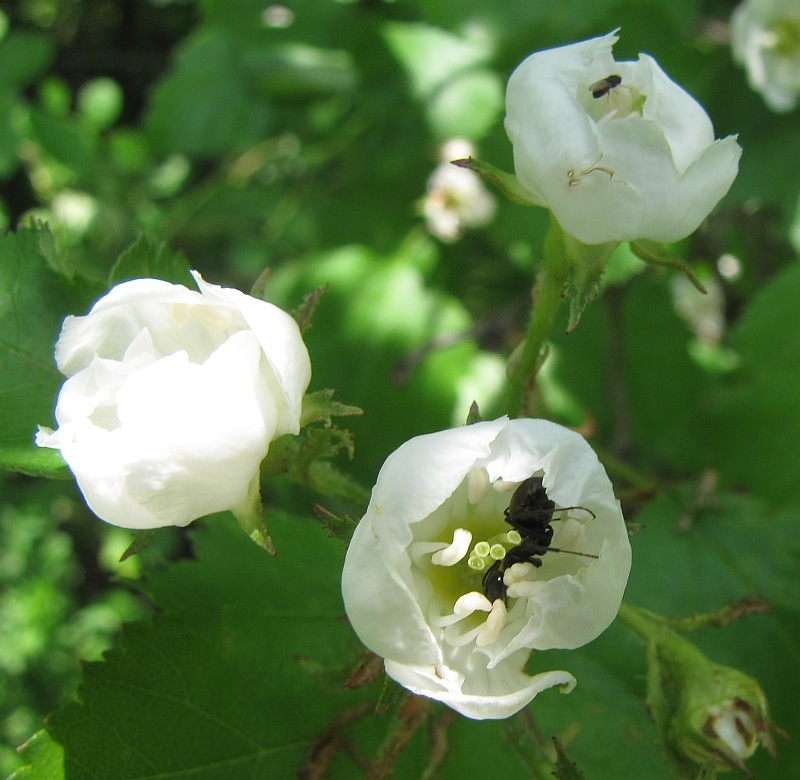 Currently, the white blossoms of Multiflora Rose dominate parts of the landscape. But if you look close, Grey-twig Dogwood and Nannyberry (both have opposite leaves and tiny flowers in dense clusters) right now also hold their own. A few weeks ago, the most conspicuous white-flowering trees were various species of Crabapples. 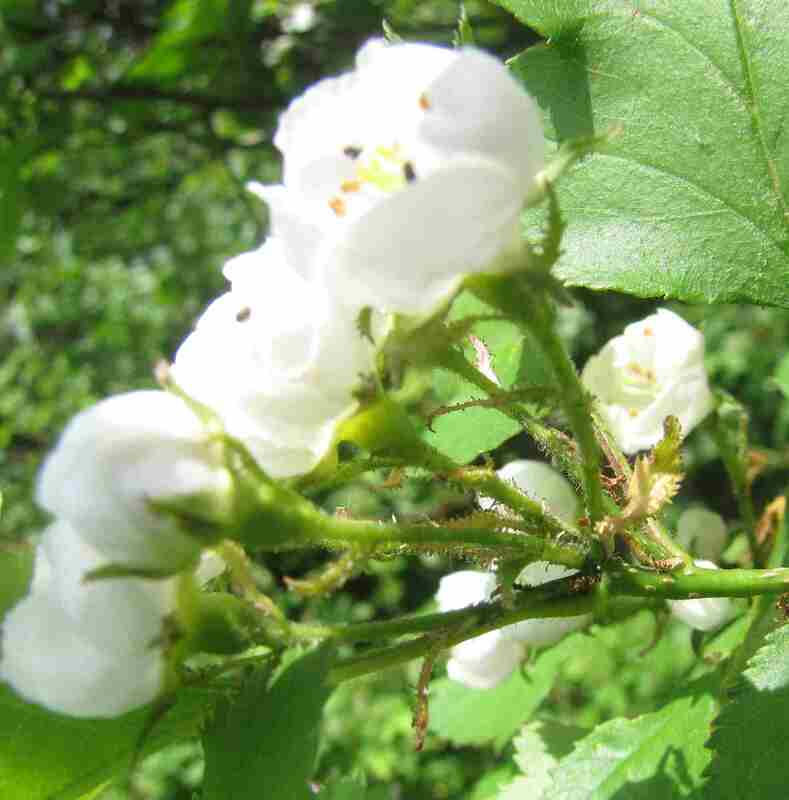 And, of course, the very first shrub to flower white in our hedgerows and along forest edges was the Shadbush. Multiflora Rose (one of our worst invasives) at its best when the fragrant white flowers highlight our hedgerows. 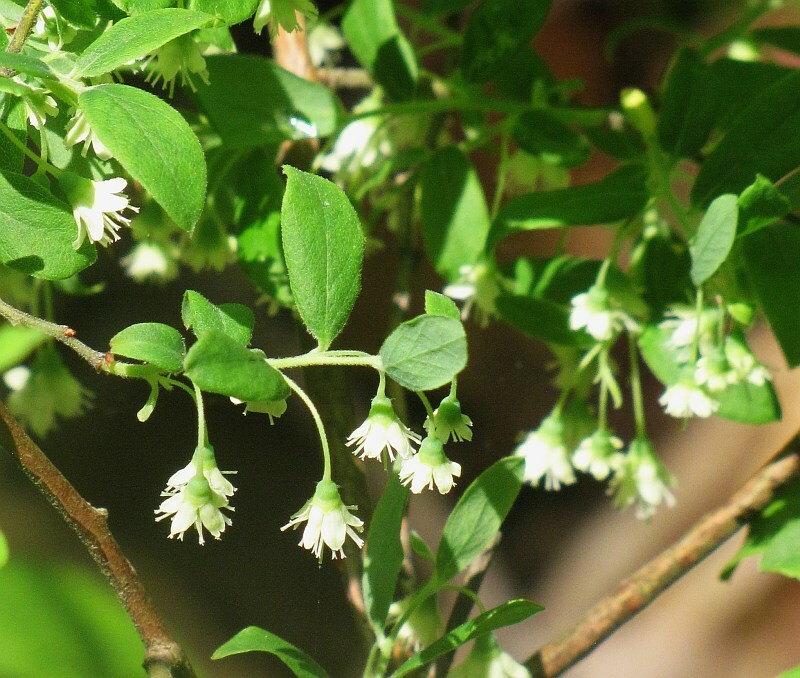 Farmers, gardeners, and ecologists have mixed feelings about this plant which obviously has great value for wildlife, but has a tendency to spread into man-made as well as natural habitats and is very difficult to remove. After our ice-storm of a couple of years ago, the forest along the creek (between the bridge and the Swim Pond) is more open. Some ground plants are celebrating the fact. 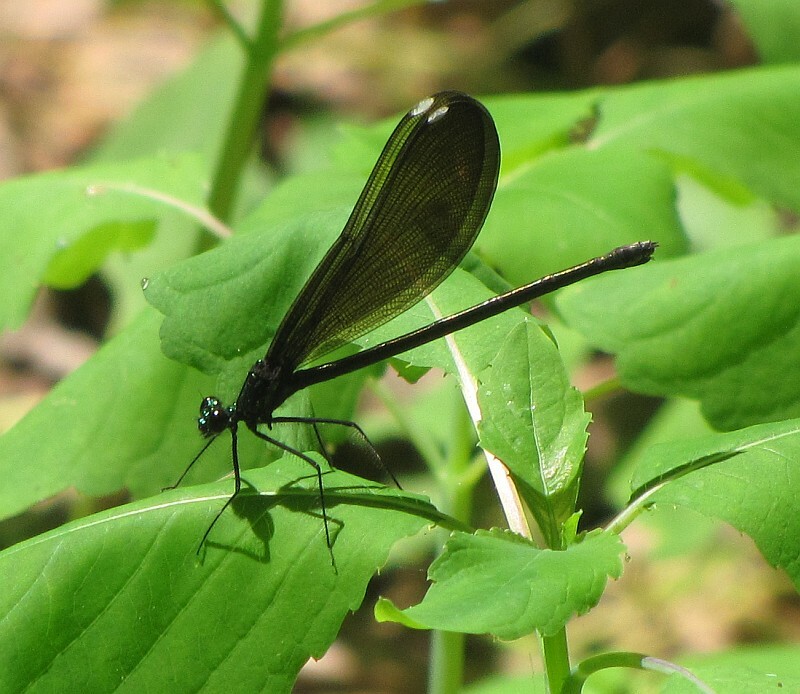 The Ebony Jewelwing is a common (& elegantly named) denizen of forested stream banks. A Yellow-bellied Sapsucker was making its way up a hickory trunk. 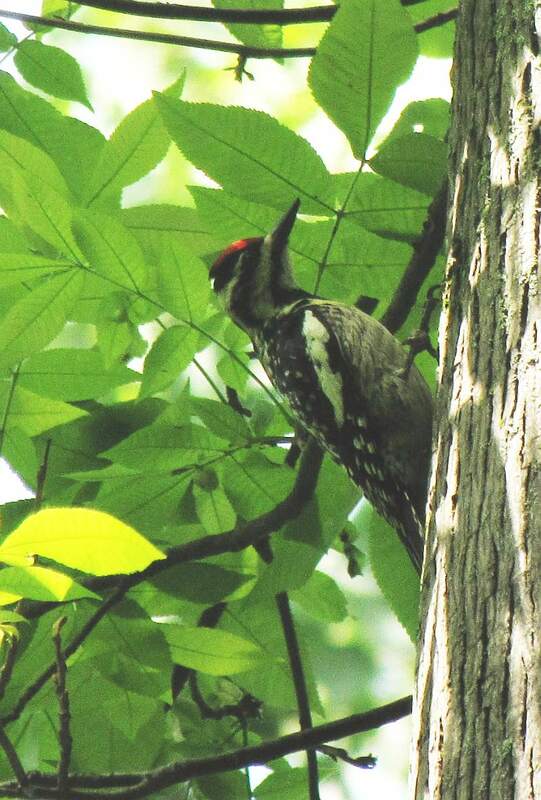 Unlike most of our other Woodpeckers, Sapsuckers are migratory, so this is probably a fresh arrival. 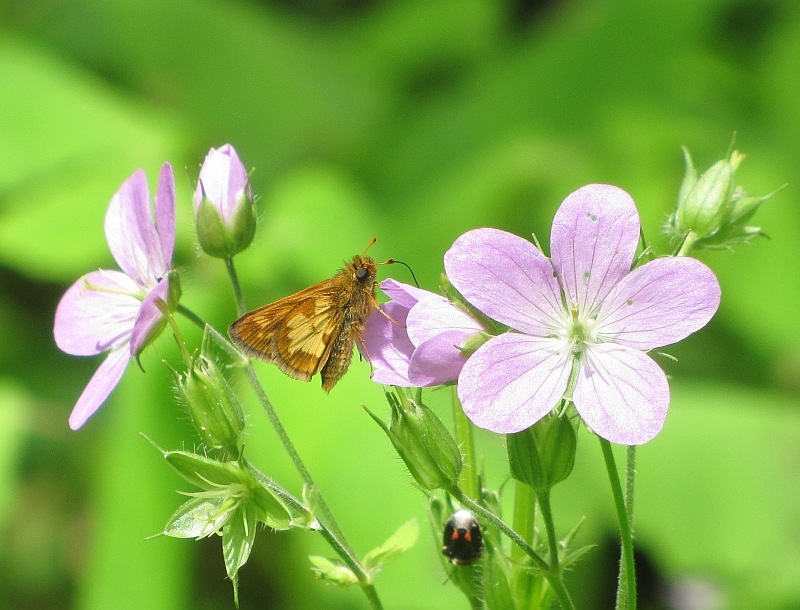 Out by the Swim Pond, this unfamiliar (to me anyway) skipper was skippering...who could it be? 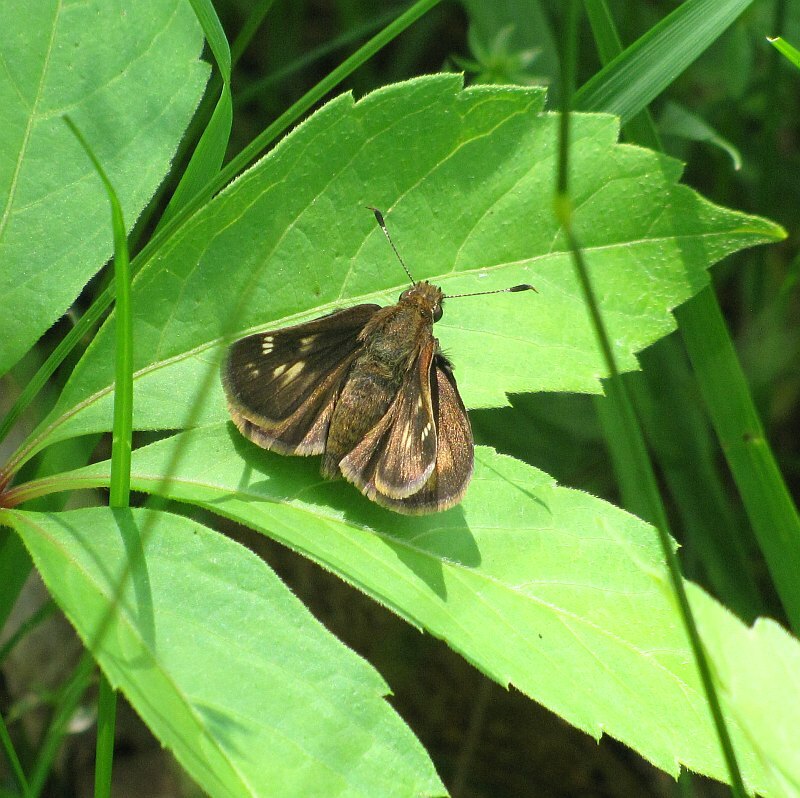 Turns out it's the dark version of this species - the Hobomok Skipper. This picture was taken at another time, but regular Hobomoks were flying nearby when I took the above photo. 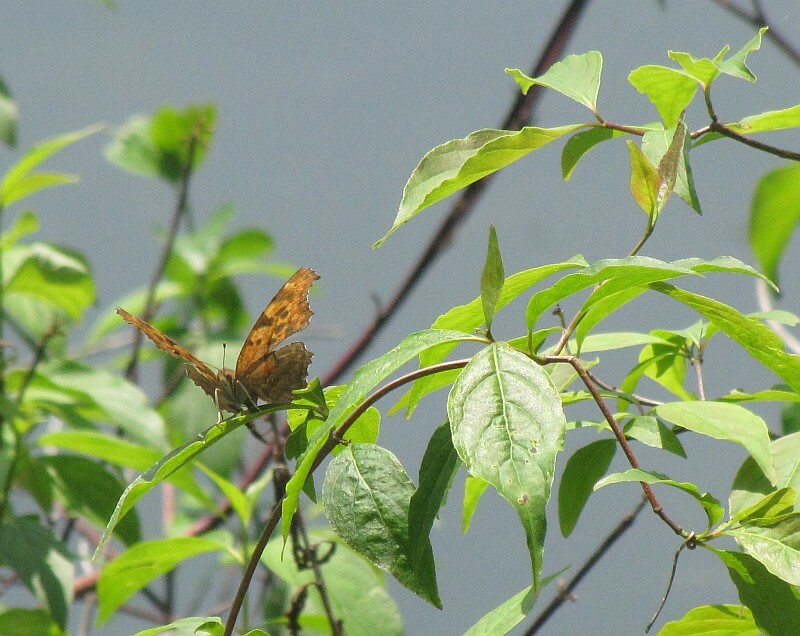 This Question Mark butterfly was also by the pond; a butterfly whose caterpillars feed upon Elms and related trees. It's a hibernator, so this one may be a faded survivor of the winter. Pearl Crescents began showing up in the low forest and were scattered along most of the rest of our trek. The pasture above the Swim Pond was 'hopping' with butterflies and dragonflies. And along the edges some Hawthorne were still in bloom. 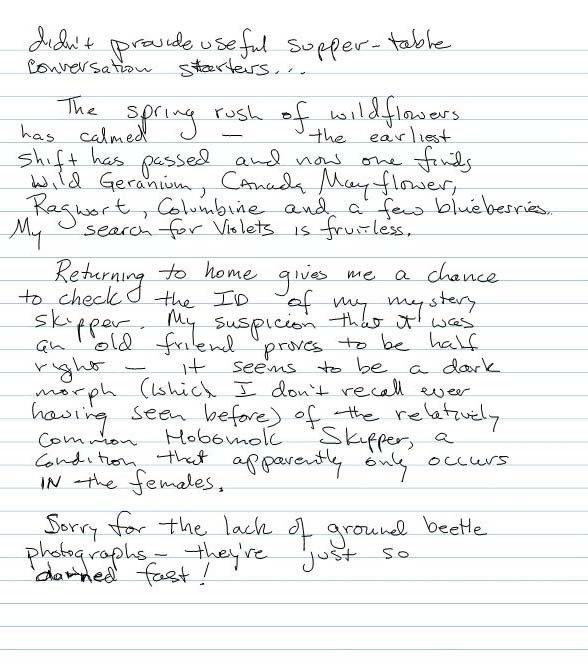 David Werier, an excellent botanist, introduced us to our local Hawthorns last week, 10 species on the Farm and counting. 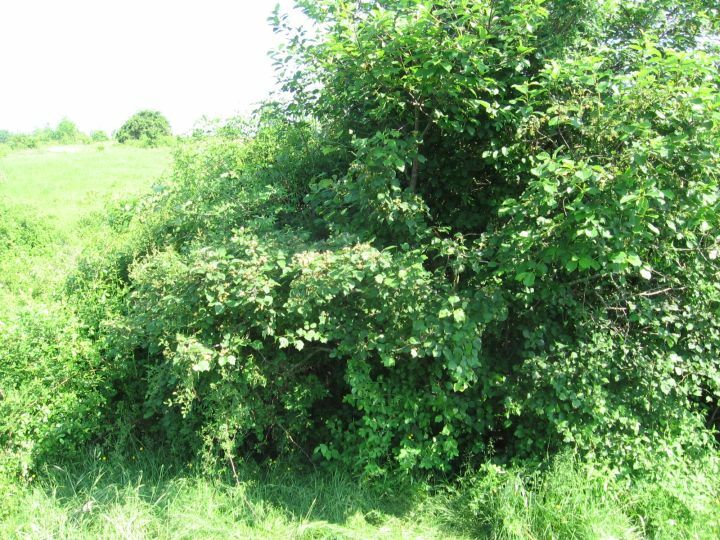 Hawthorns are particularly interesting because they are a set of largely native species which are now found predominantly on farms. One character that one uses to ID the Hawthorns is how fuzzy the flower stalks are. Compare these stalks ..
to these. Claudia will guide you through some of tour Hawthorns in an upcoming blog, so stay tuned. However, I'm allowed to talk about the bugs on the Hawthorn - ants were numerous as were tiny flies (whose identification I will leave to a more devoted entomologist). 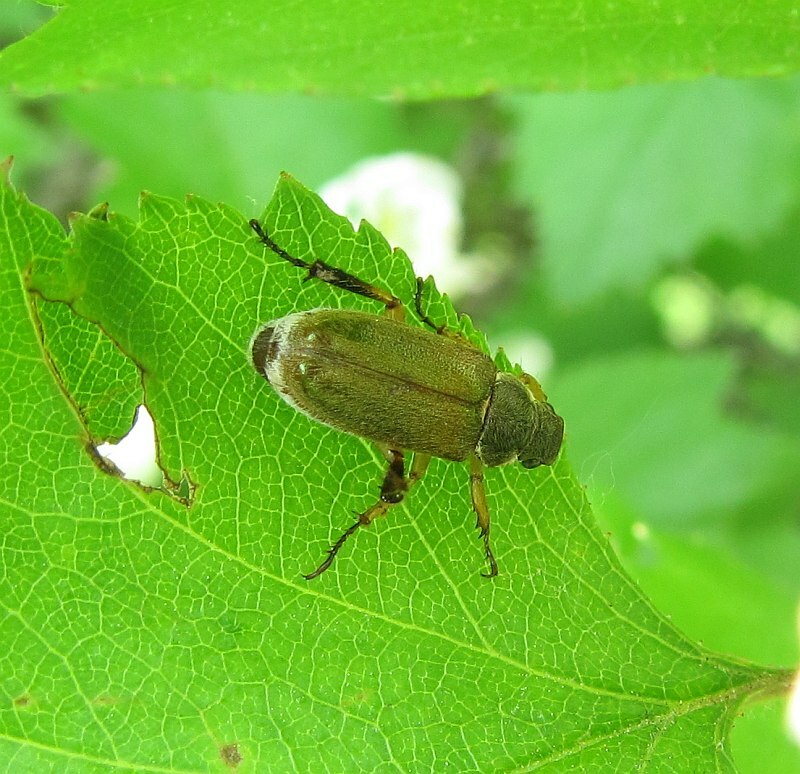 This leaf beetle, a so-called Dichelonyx, was hiding out in the Hawthorn foliage. 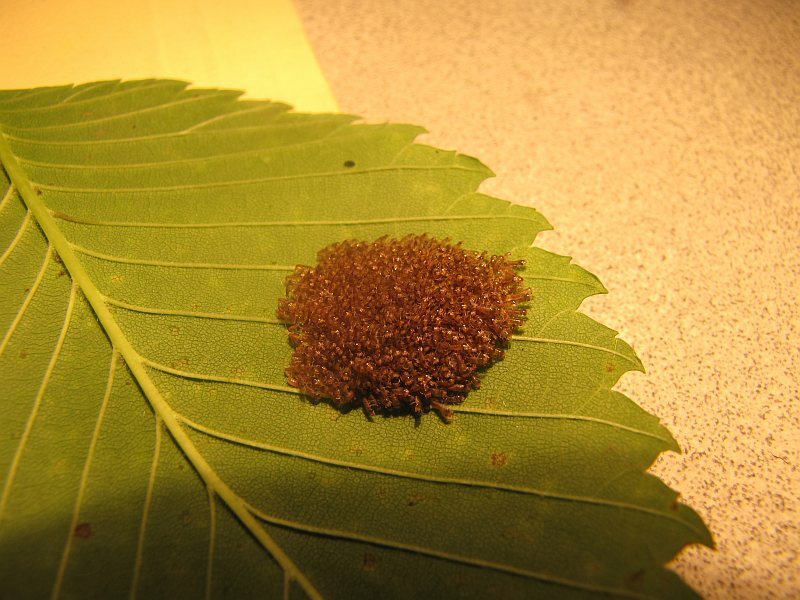 Apparently, this group is composed of leaf-eating beetles whose larvae who feed on roots. 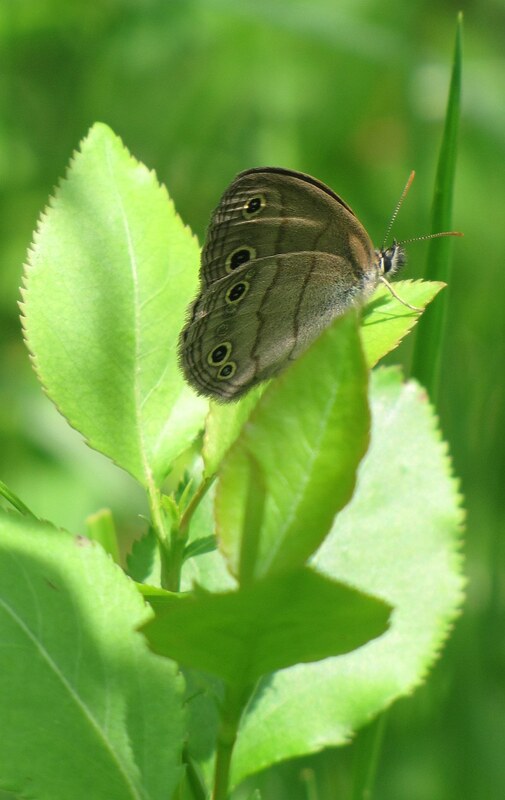 The Little Wood Satyr is closely related to the Common Ringlet and you can see it in their flight. Both bounce about the fields as if dangling from an unseen string. 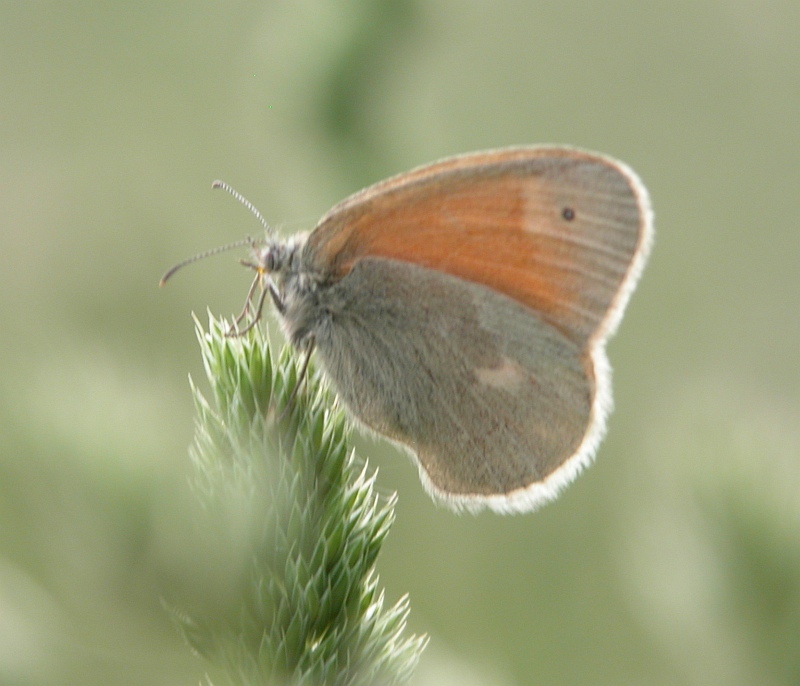 Both this species and the Ringlet were common about the pasture. This is a Common Ringlet, photographed on another day, in another field. 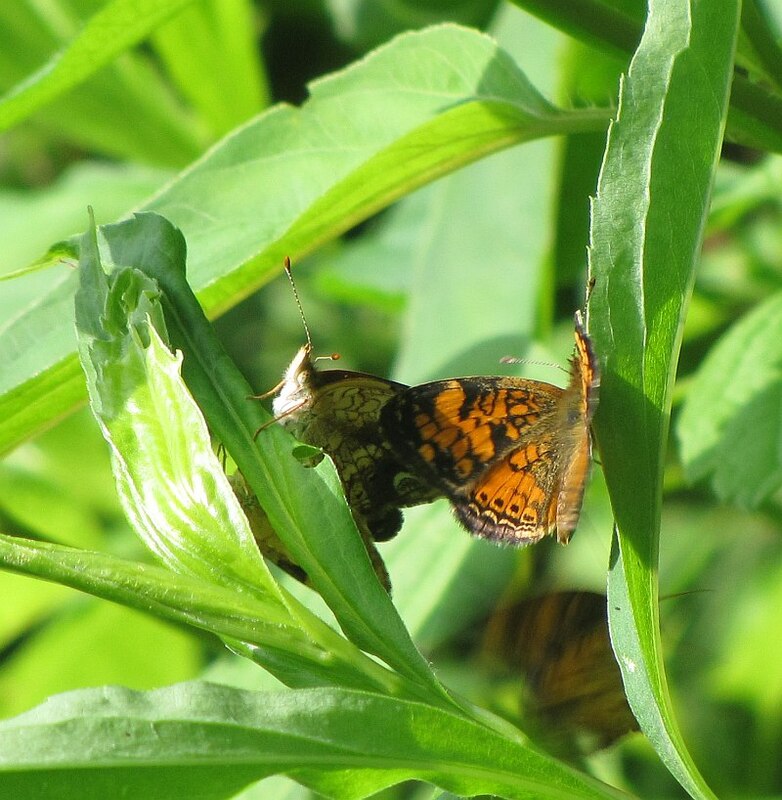 They don't always have such sharp coloration but you can usually pick up the flash of rusty orange as they fly. 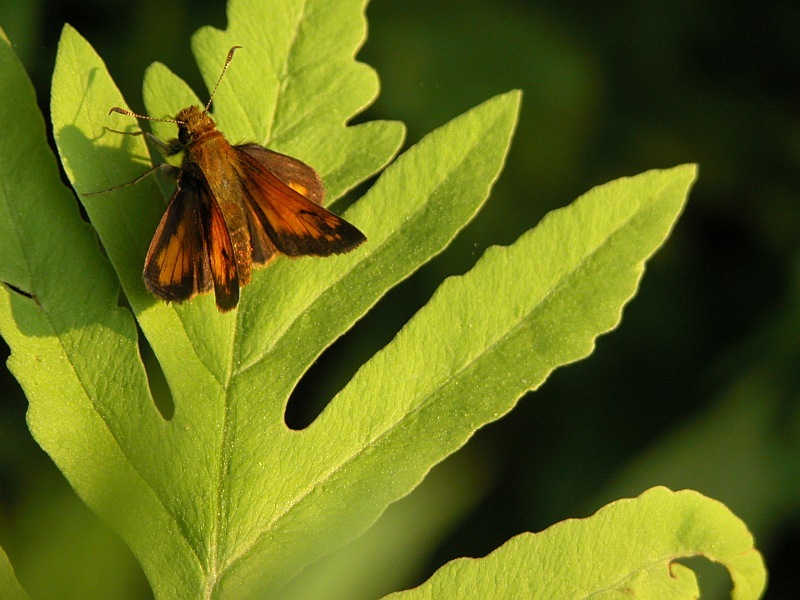 Also afield was the Peck's Skipper, one of our most common skippers. It has a long flight period from May to October, probably encompassing at least two distinct broods or sets of hatches. There were numerous dragonflies about also, probably cueing in on some of the same flies that were occasionally haunting my head.. 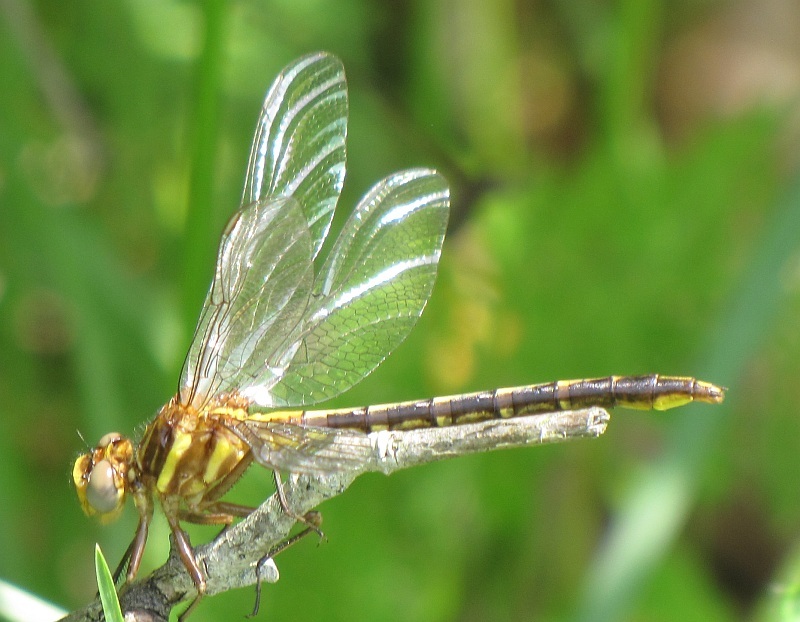 This one appears to be some sort of Clubtail, probably hatched from a larva that grew in the Creek (rather than the pond) below. 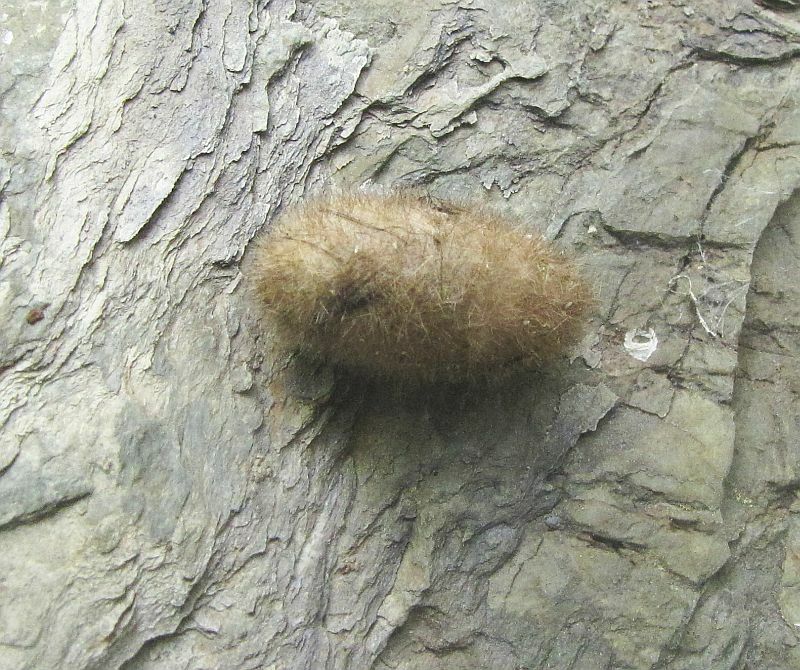 As I moved up towards the top of Phudd Hill I began turning rocks, a few Red-Backed Salamanders and the occasional ground beetle and ant, and this fuzzy fellow - apparently the cocoon of a Woolly Bear Cartipillar or, to use the more conventional naming pattern, of the Isabella Moth. 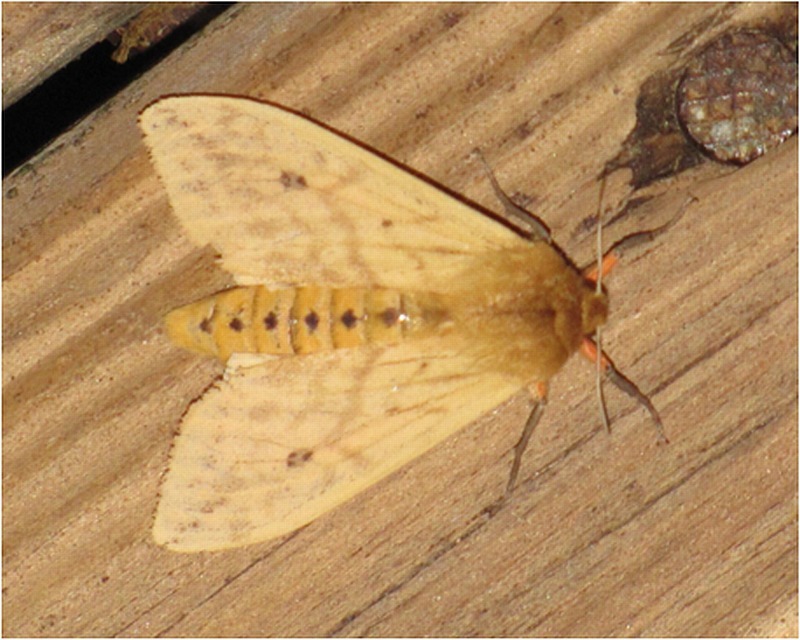 An Isabella Moth, the adult of the Wooly Bear caterpillar, photographed last summer at a light on our back porch. 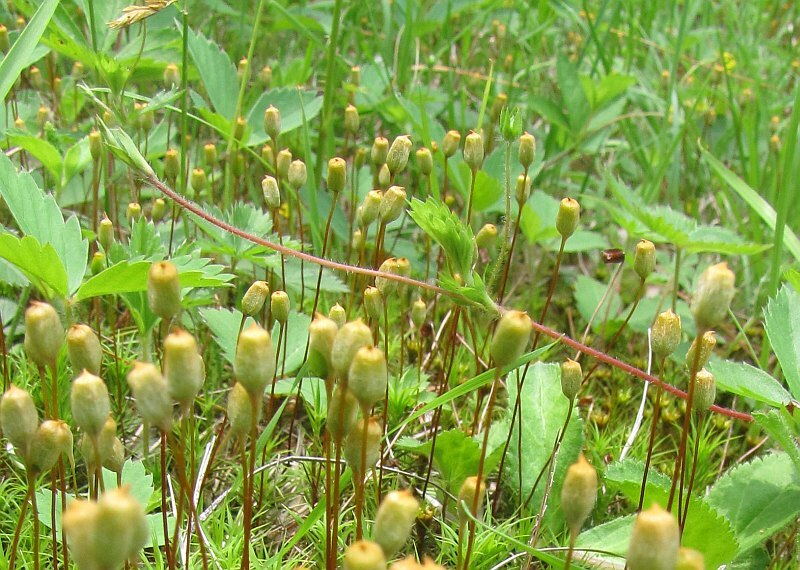 The flowers were relatively scarce on the hillside, although the spore capsules of the mosses looked eager to pop. The view from Indian Lookout, just about at the summit of Phudd Hill (close enough for me in any case). There is still the occasional Columbine flowering on the rocks. 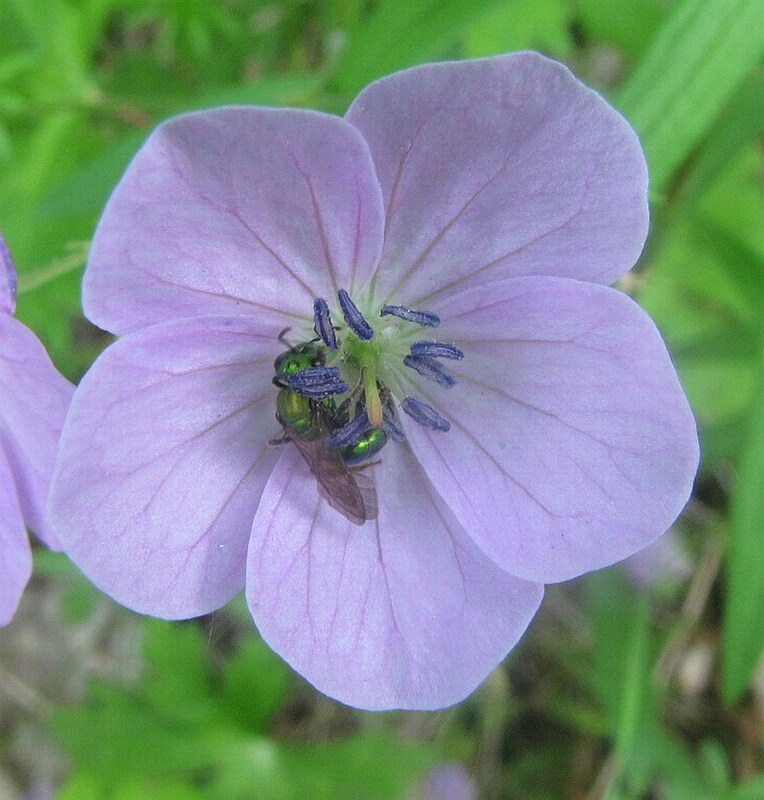 Wild Geranium scattered from high to low through the forest, some, like this one, equipped with green Sweat Bees. According to Claudia, this is Round-leaved Ragwort... can't say I see the round leaf... guess that's why I'm not a botanist. In any case, only saw the one of these in flower. 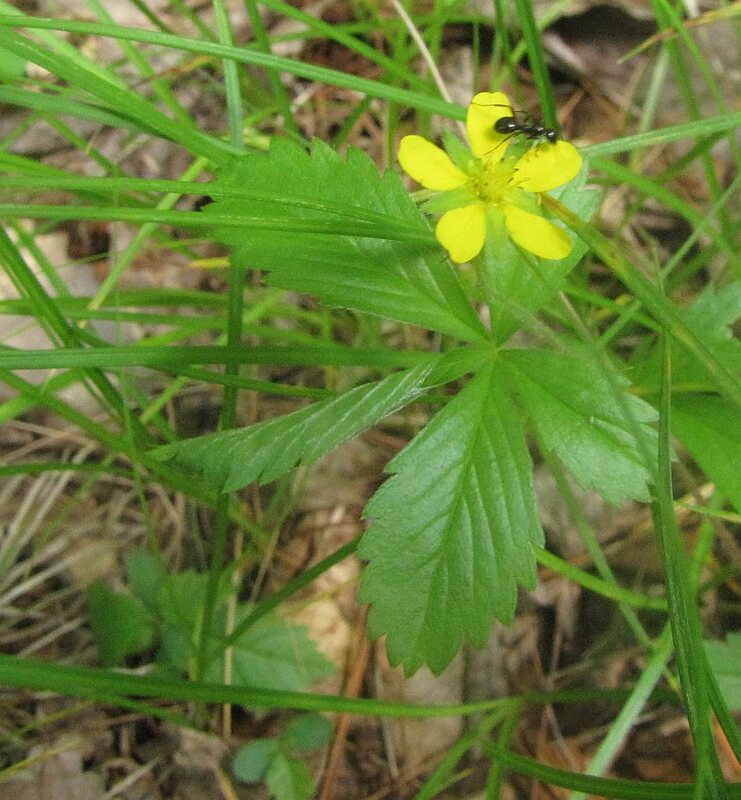 The yellow-flowering Cinquefoil was all about; those ants are busy, and probably collecting pollen or nectar. 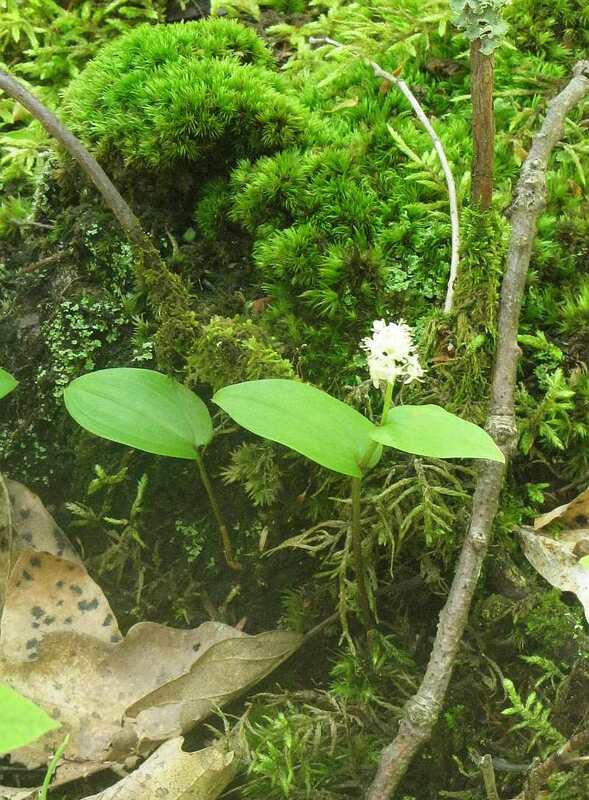 The small, aptly-named Canada Mayflower is abundant. At least one species of blueberry (Vaccinium) is still flowering. 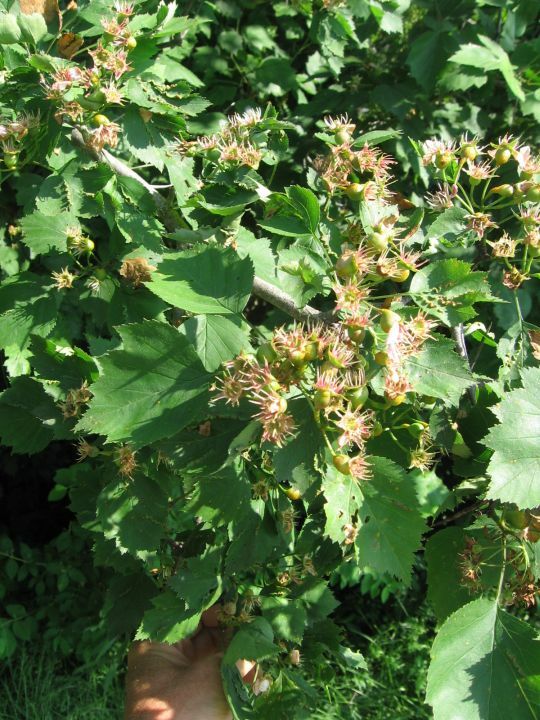 It seems relatively common and vibrant on the top of Phudd Hill, at least relative to the tentative Oak saplings. 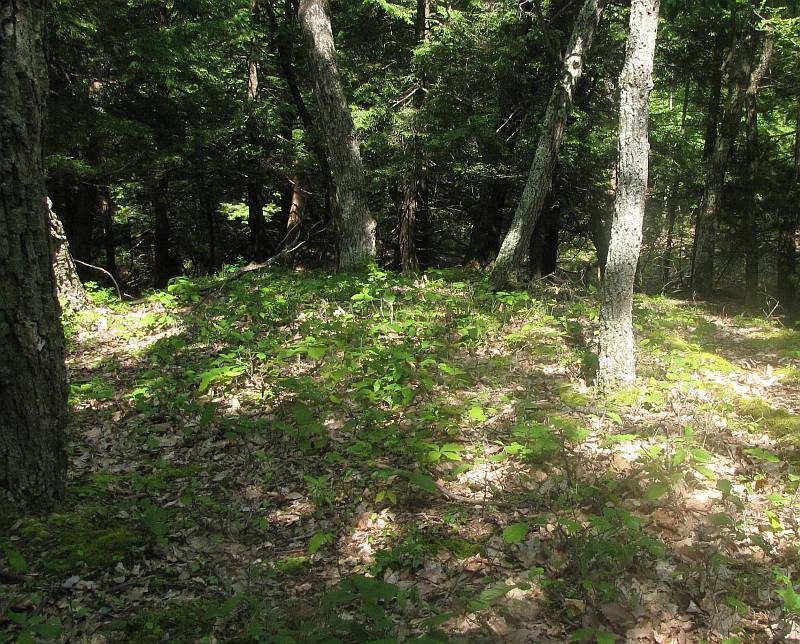 If one thinks about this forest picture for a minute, you'll realize that this mowed-lawn appearance is unnatural. White-tailed Deer. 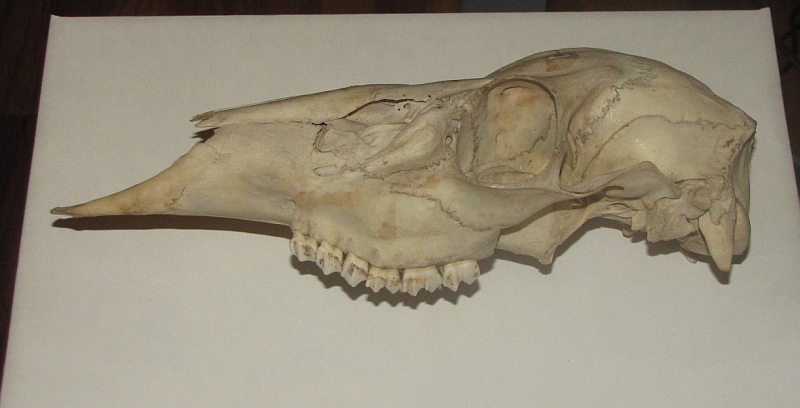 Deer, like some other ungulates, don't have upper incisors (the teeth at the front of the mouth). They do have lower incisors - not pictured here - which clip off browse by cutting against a leathery upper palate. This leaves the rough cuts shown in the previous photograph. 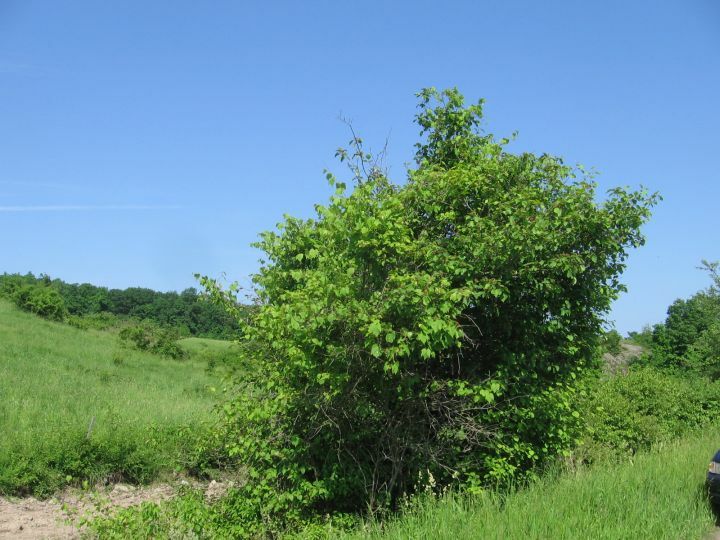 It seems likely that heavy deer browsing is favoring Vaccinium over Oak atop Phudd Hill, and if deer populations remain high, one might predict that, as the older Oaks die off, the hilltop might move towards being a large Blueberry opening. 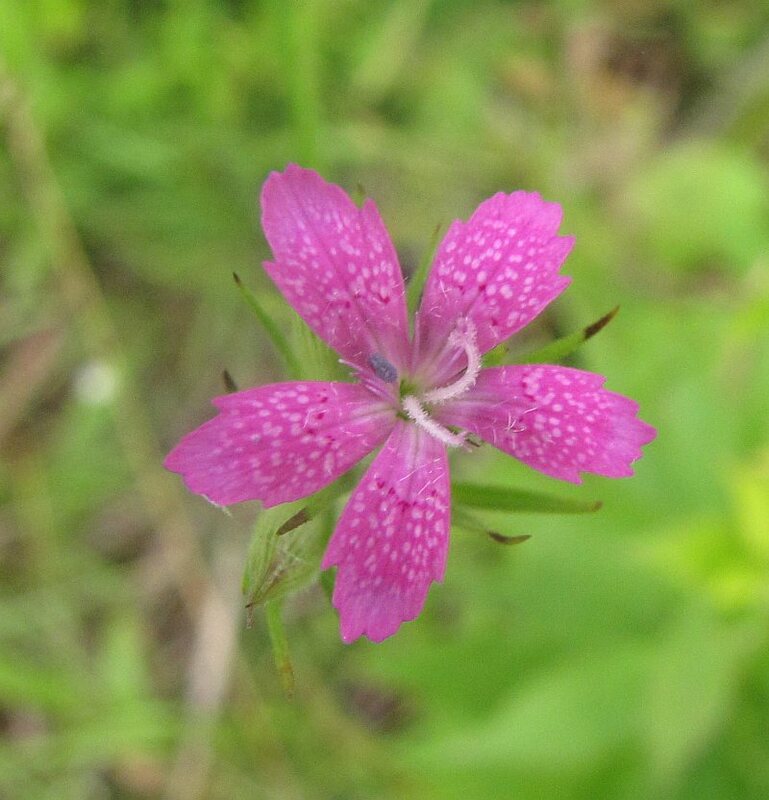 Not only is Oak regeneration being curtailed, but high deer populations are probably also reducing the populations of various wild flowers, including our native orchids. Not so many butterflies up top, but there are odonates, like this Spreadwing. 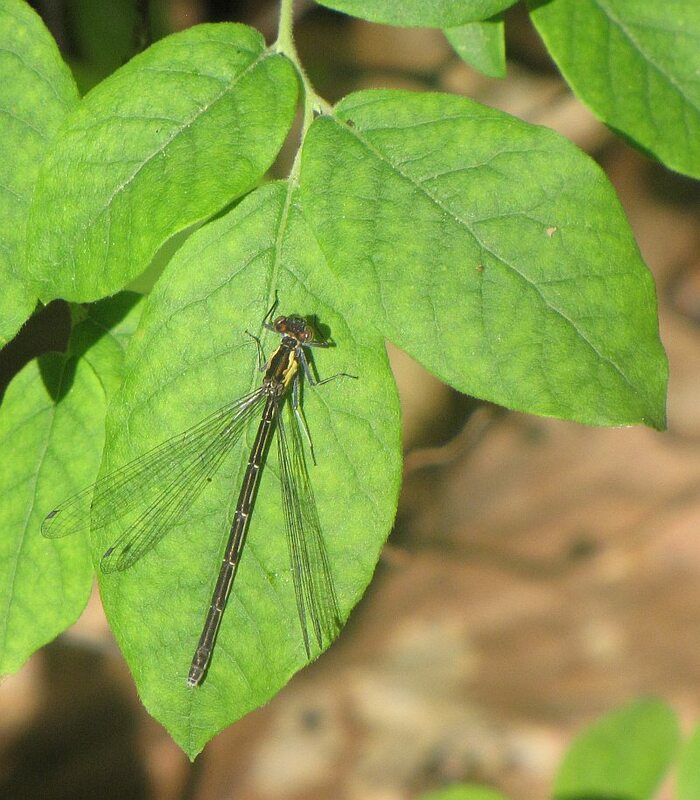 Spreadwings are a group of damselflies who hold their wings in this half-closed/half-open manner. Its larva probably grew up in one of the permanent ponds nearby. And finally, this photograph which I just took from my window as I work into the night finishing this blog.  OK, it's been Photo-Shop'd a bit, but I did just see my first Fireflies of the year!